A lovely meeting, lots of Christmas food and a delightful Christmas exchange. 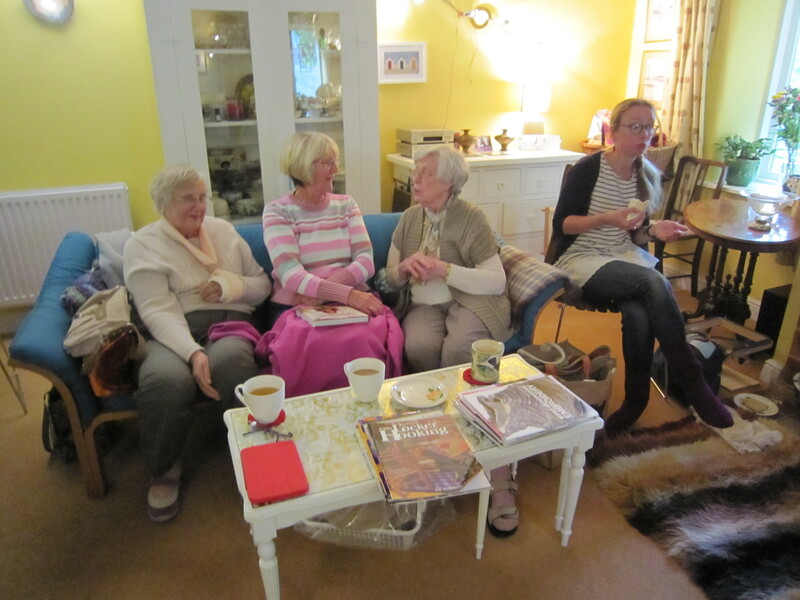 We had a really good turn out for the meeting as well, so lets hope that keeps up in the new year! 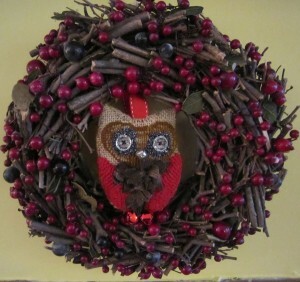 Our theme for the exchange this year was Christmas owls. 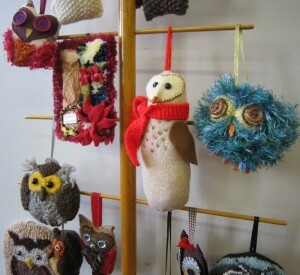 It was a delight to pick one from Santas sack and hang it on our favourite wooden tree. 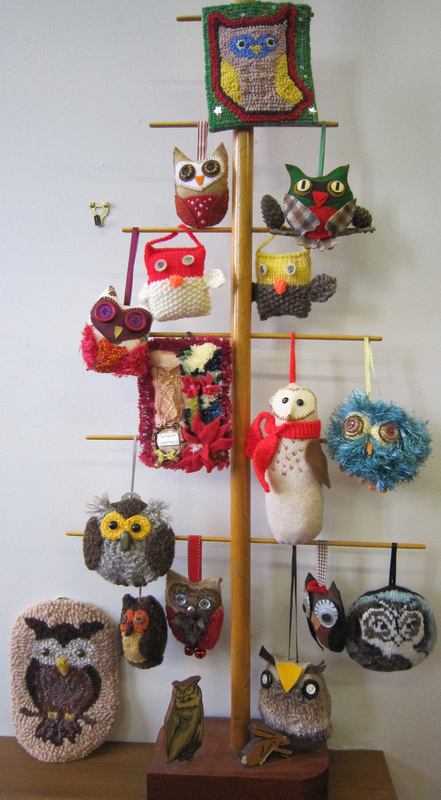 The pictures are of the tree complete, a couple of close ups, and the resting place for the owl I was given, over Christmas at home. 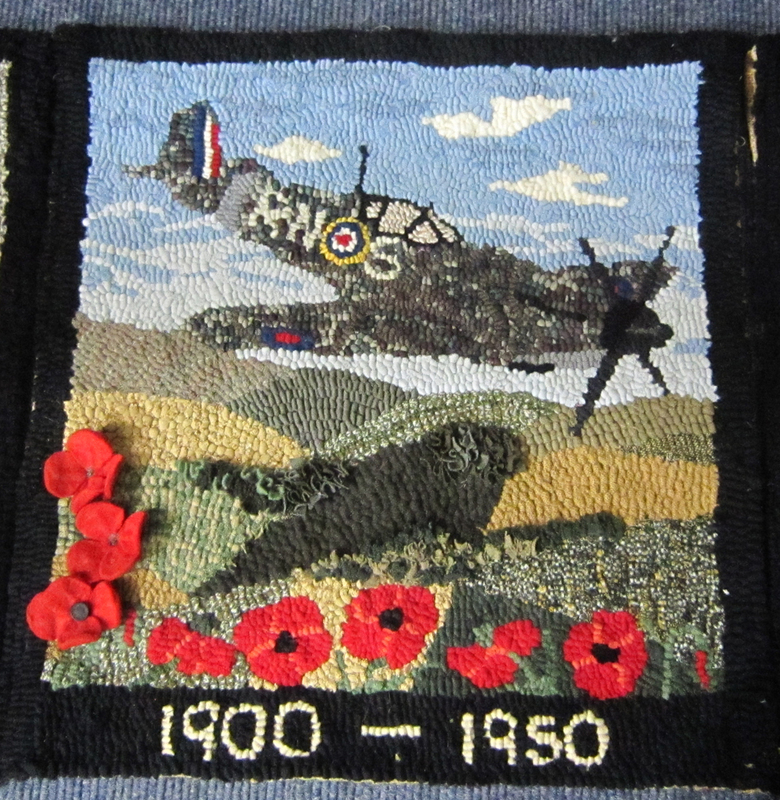 An update on the poppy Remembrance rug for Bradford Libraries. Here it is now, with some of the central poppies taking shape as well. The Ist year birthday for city library in its new building also saw lots of poppy prodding at the beginning of December. 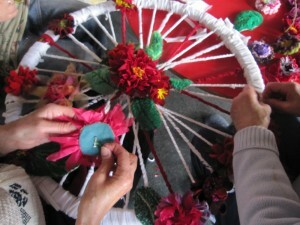 Im looking forward to seeing the progress in January, I couldnt make this event. This is a close up of one corner, still a bit to fill in…. 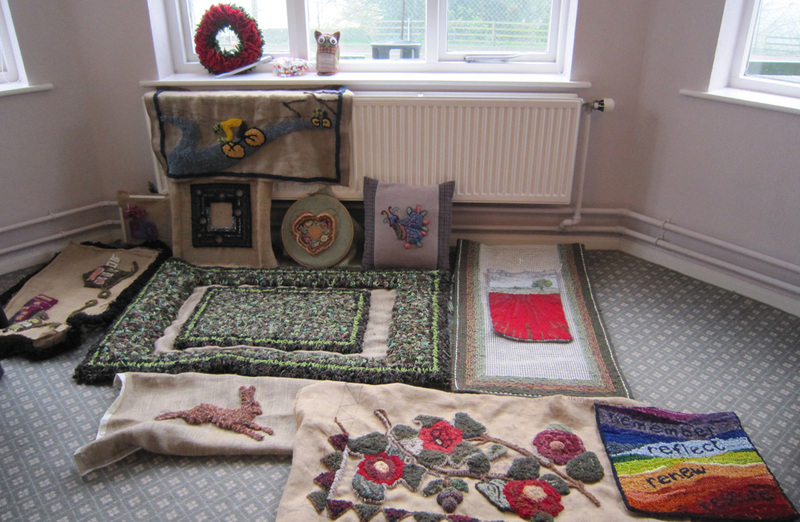 We had two lovely traditional proddy rugs brought to the meeting. 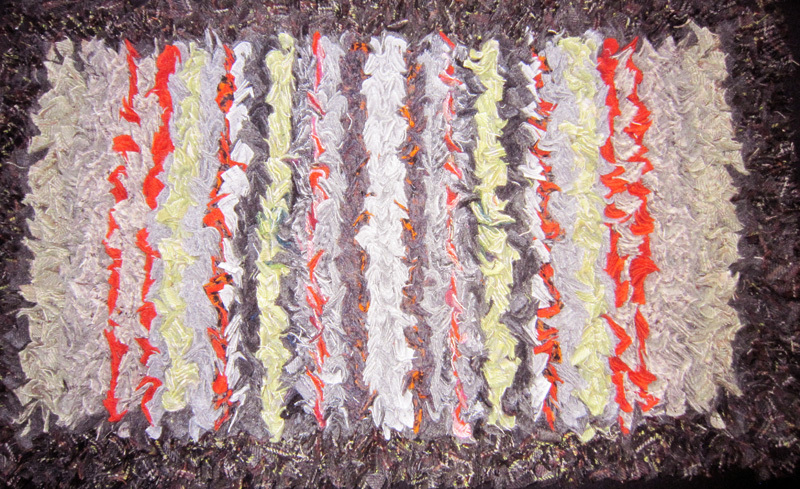 Christmas was always the traditional time to finish a new rug, just imagine how proud the family must have been to unroll rugs like these for their Christmas celebrations. 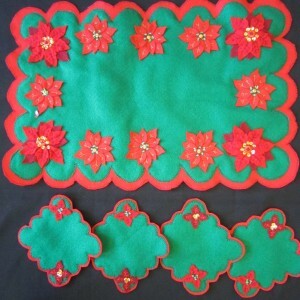 Also on a Christmas theme, I bought a Bucilla Kit for making coasters and napkin holders from a charity shop. 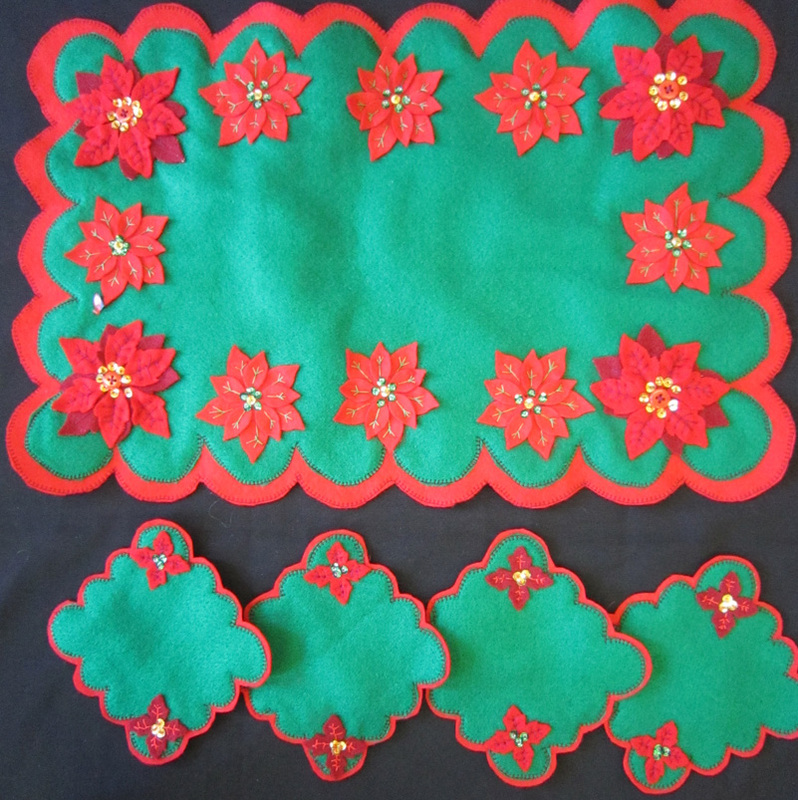 I did not think I would use the napkin holders, so redesigned the kit to make a penny mat Christmas cover for a table. 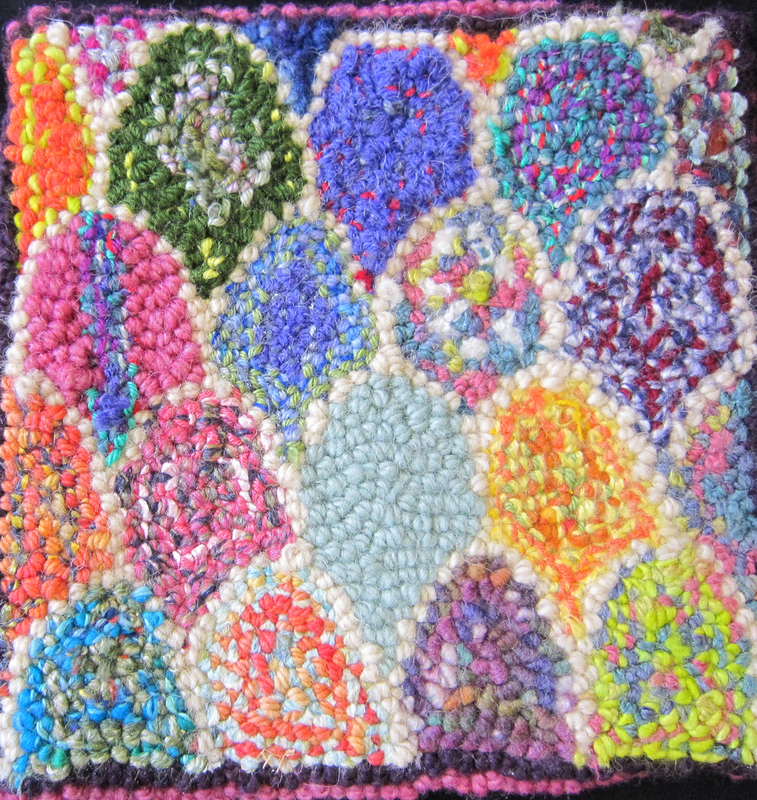 When I finished it, Christinea gave me a pot of flowers as a thank you for the help with the Poppy rug, and they sat on the mat all Christmas and looked really pretty. 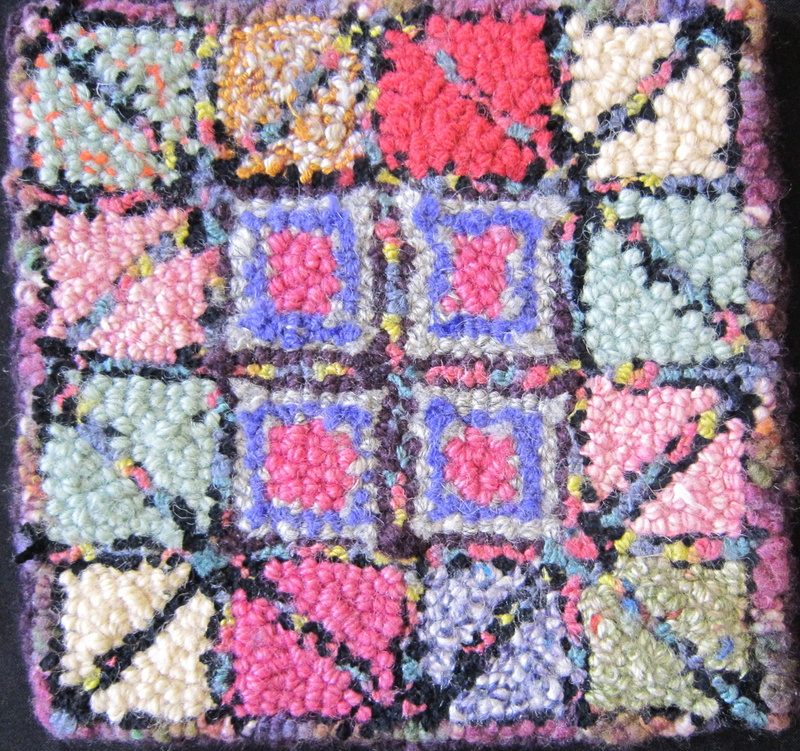 Finally these Bunka dolls house mats were meant to be finished last Christmas….they are for my sister in law who has quite a collection of furnished dolls houses. They are only tiny, and my first attempt at bunka. 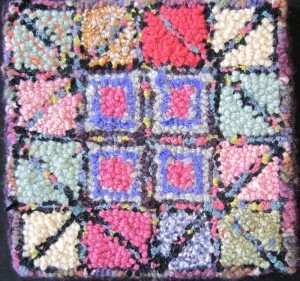 I tried to copy old rug patterns. 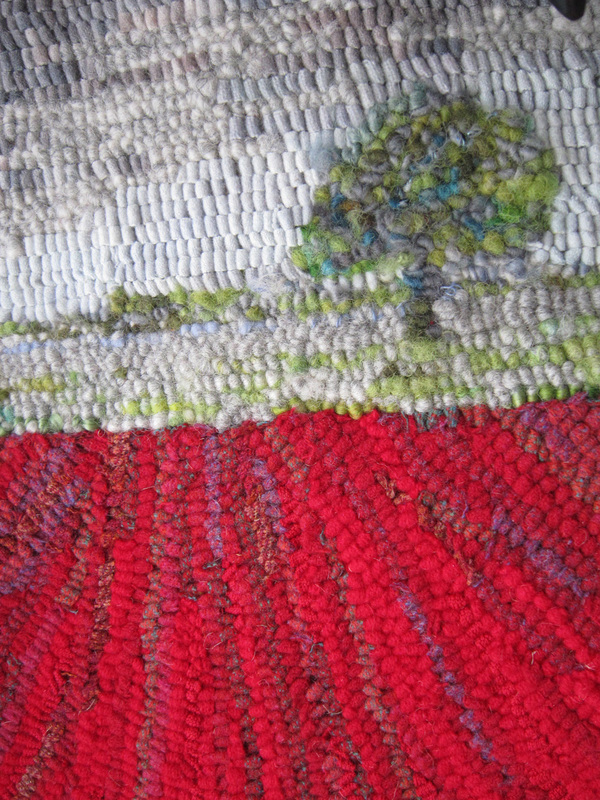 Nearly the end of another lovely year of rug making. 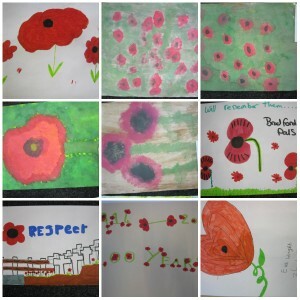 We have been delightfully involved in the memorial Poppy rug for Bradford Libraries. 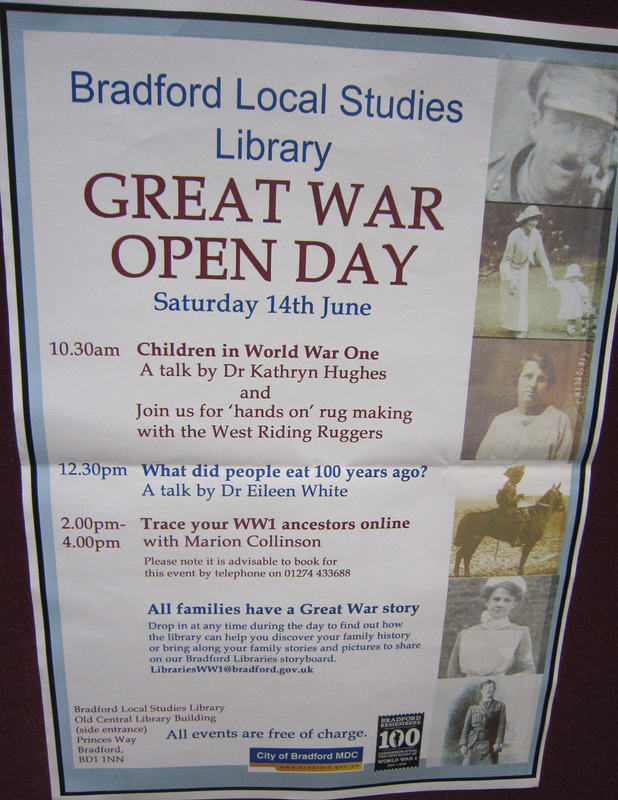 I have to thank Christinea and Carol of Bradford Libraries for their continuing support, organising all the events we have attended, and then also the logistics of getting the rug from place to place. 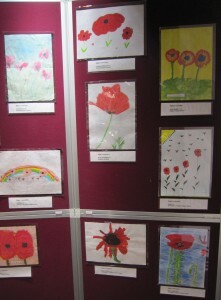 We were at the Peace museum in Bradford yesterday, with lots of school children assisting us. 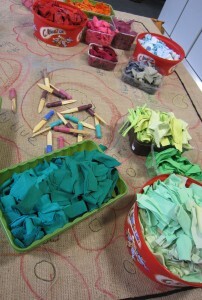 Lots of schools are thinking of making their own rug, the children have enjoyed the prodding so much. 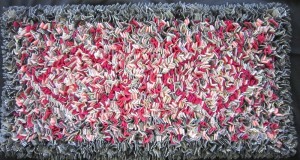 I have just been told that over 500 people have now had a hand in creating the rug. 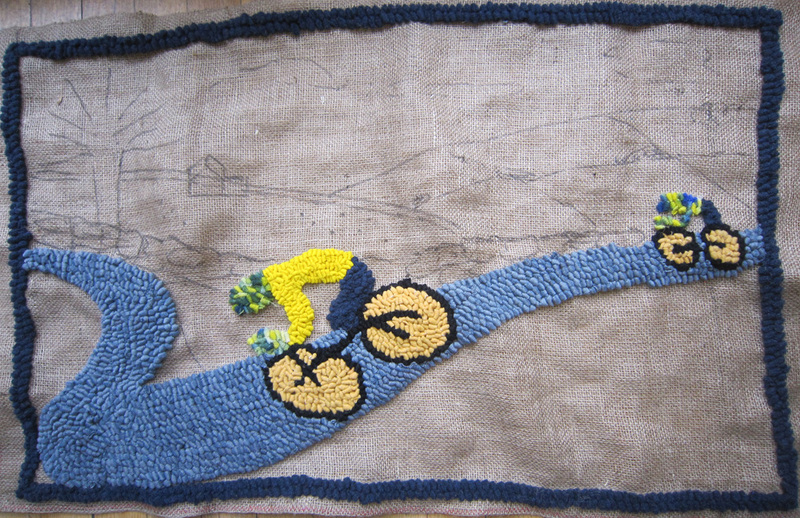 Everybody is asking when its going to be finished.. there is still quite a lot of work to do, and the ruggers are hooking all the words for the border after the main body of the rug is complete. 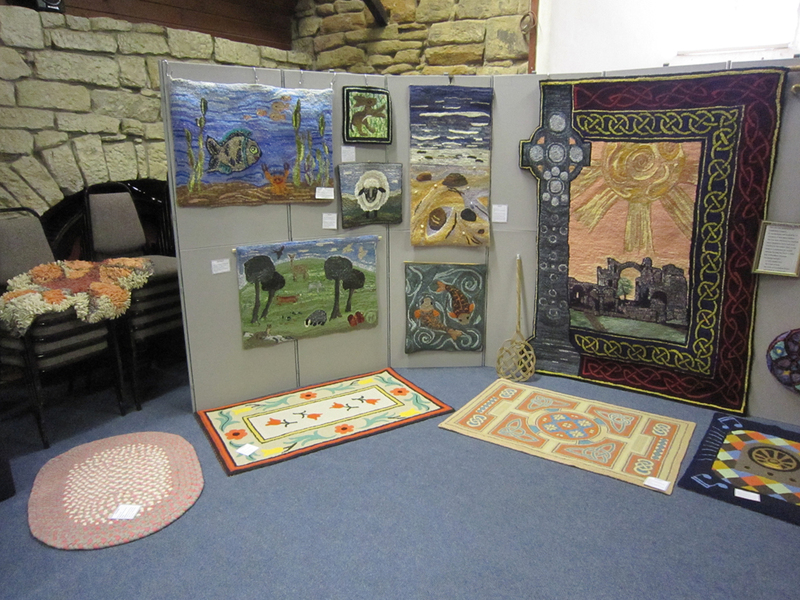 At the meeting two new rugs were brought along to our show and tell. 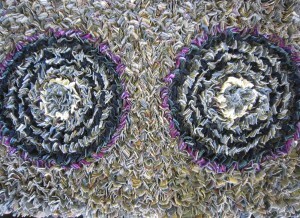 they are both lovely, one is all prodded, the other has a centre of hooking and a proddy border. 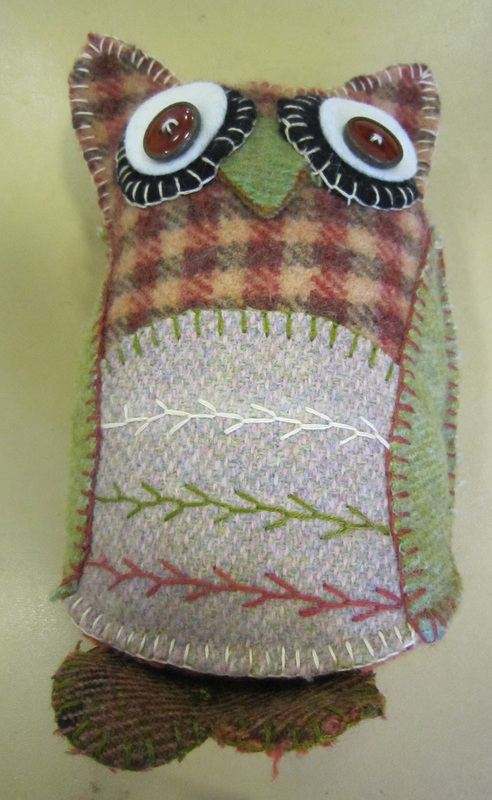 We are making owls in all shapes and sizes fr our Christmas exchange, so they will be on next months post. 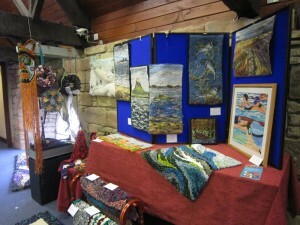 Some of the members managed to get to Yarndale this year. 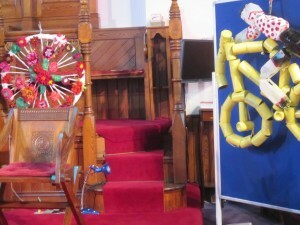 It was a treat, although the Saturday was very busy and the catering facilities struggled to cope. Also please more buses from the Skipton Building society site.. 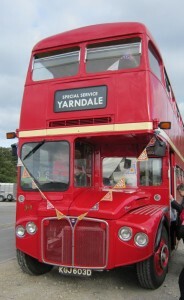 Loved the red bus adorned with bunting, and all the mandalas around the halls. 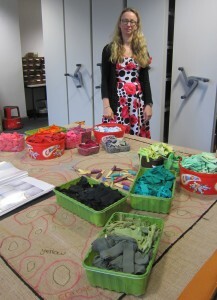 My favourite stall: Jen Bests Dorset buttons. 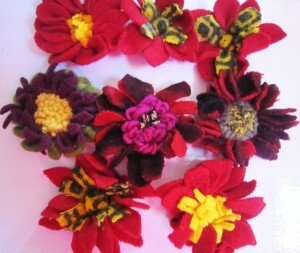 Just working out how to incorporate the buttons into a rag rug now. 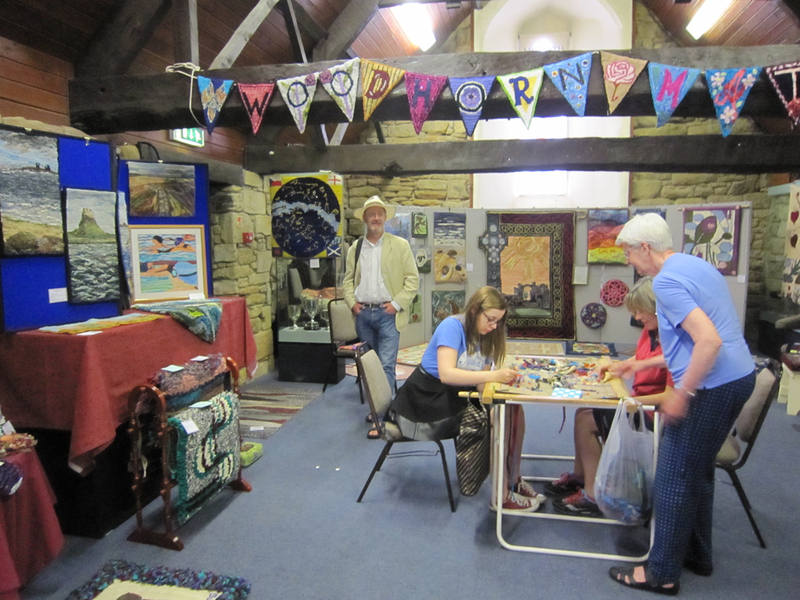 It was delightful to see lots of youngsters coming away from the show with big bags of yarn..
Two of our group joined the annual Reeth rug retreat. 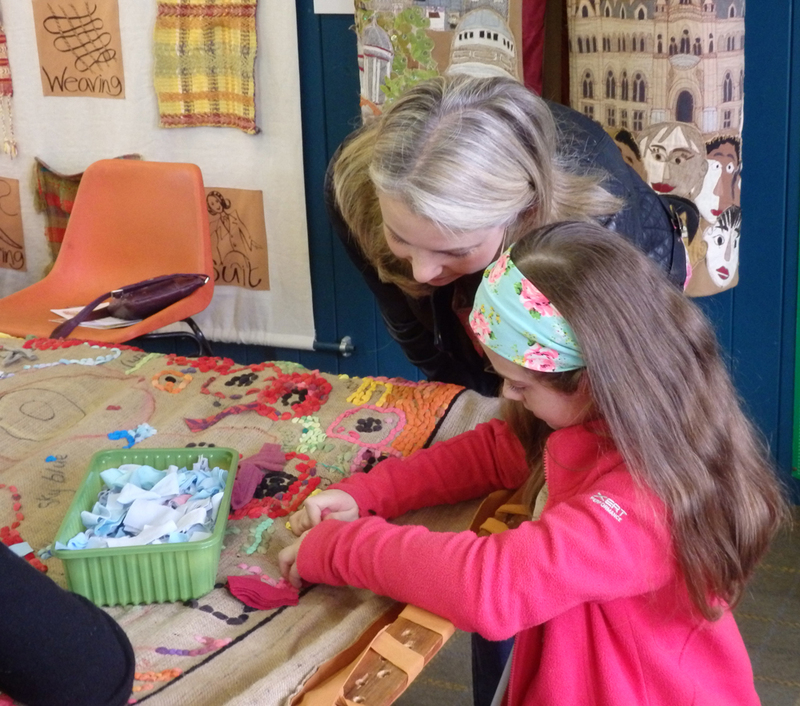 they had a great time, their workshop was with Amy Oxford, and they brought the punch needle projects to our meeting to share. In the workshop they tried various materials through the punch needles.. some were good, others more tricky. 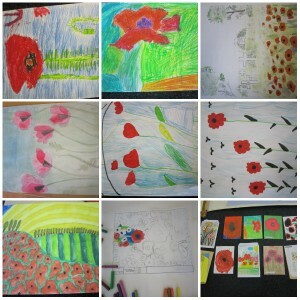 Two members had finished fantastic landscapes. 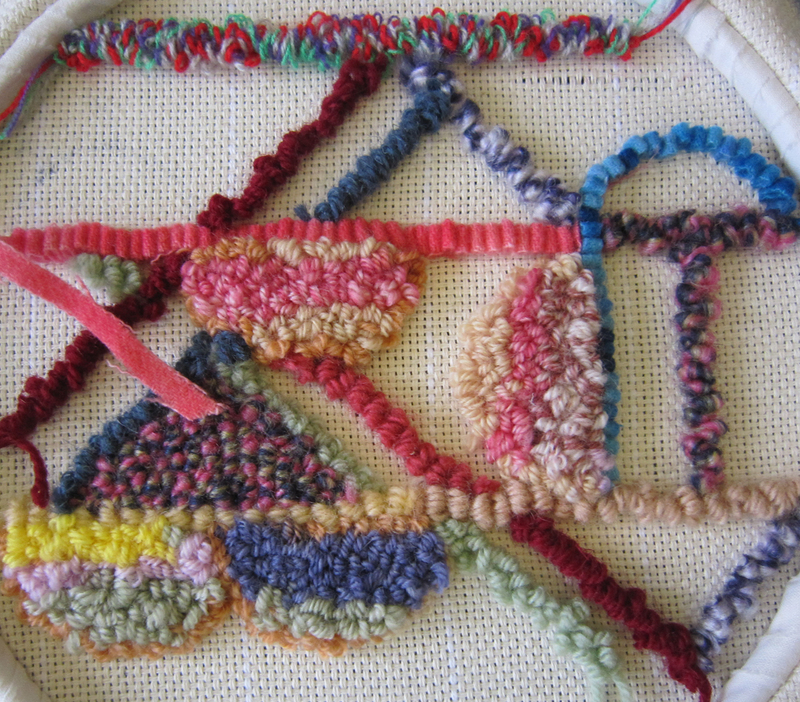 It is lovely to see some pictorial rugs again in the group. Our harvest festival theme continued with some new pumpkins, and a hibernating hedgehog. 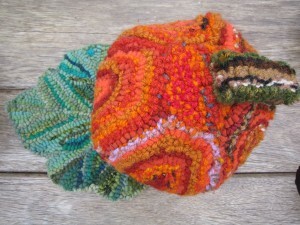 The hedgehog is from one of the kits sold by “Craft yourself silly”. 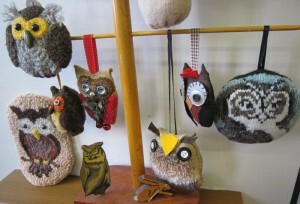 They can be bought on Ebay. 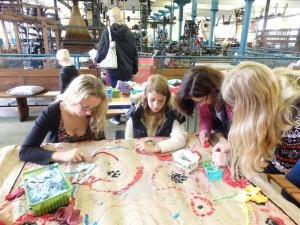 And finally.. some lovely photos from the recent day at Bradford Industrial Museum working on the WW1 Poppy rug for Bradford Libraries. 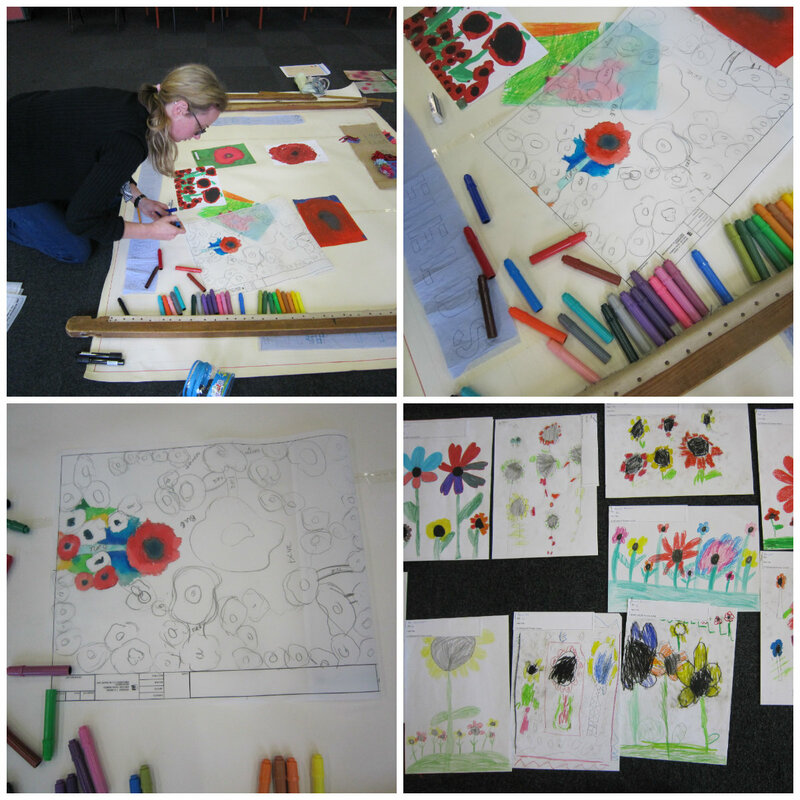 We have some more sessions coming up in the Autumn half term at the Central library, Keighley Library and Eccleshill Library, and a schools booked session at the Peace Museum in November. 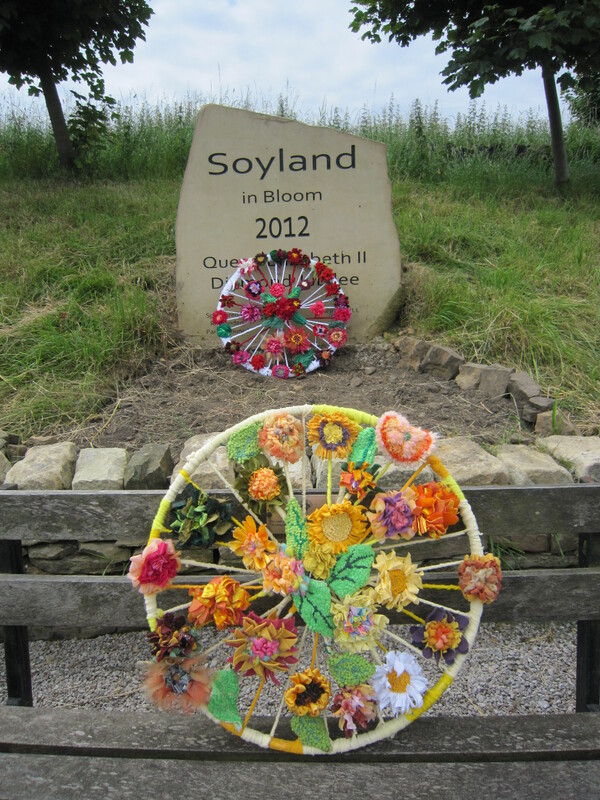 Thanks to all involved for allowing us to use these photos. 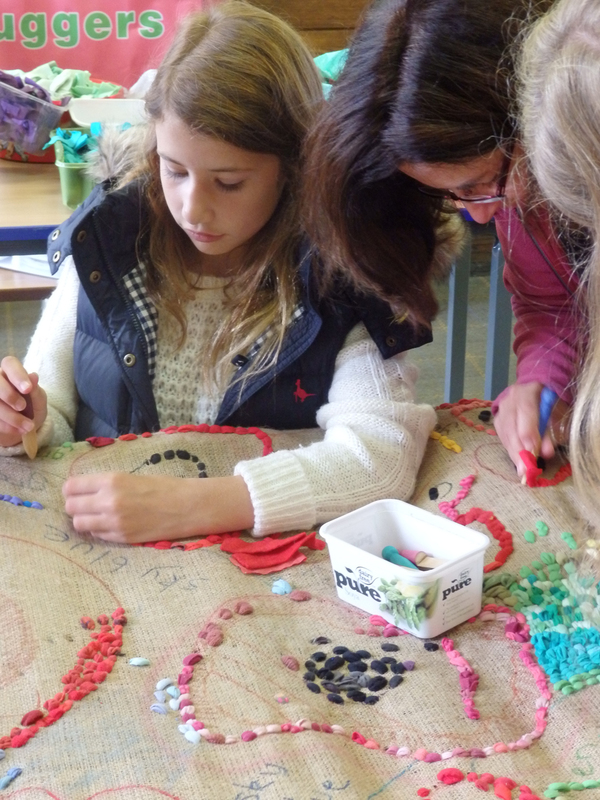 Lovely to be back again after the summer. 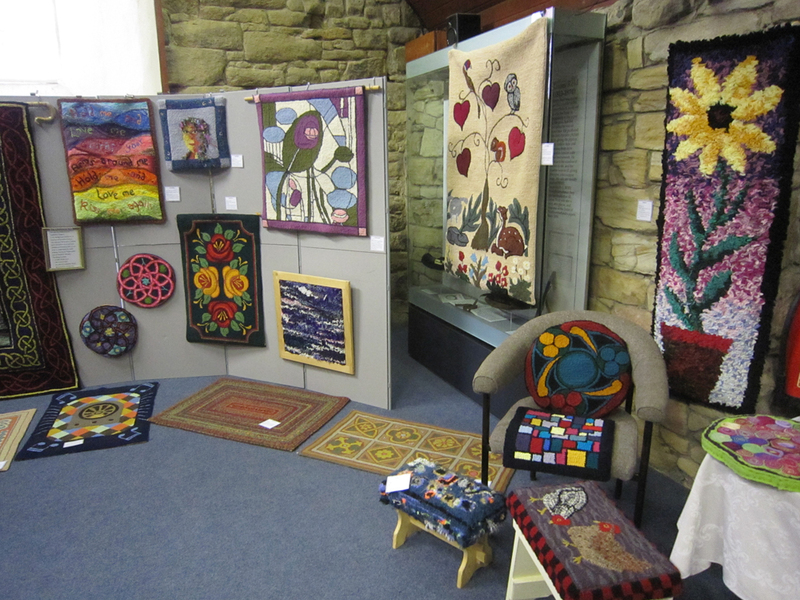 We missed the folk at the Reeth rug retreat, but are looking forward to seeing their endeavors next month. 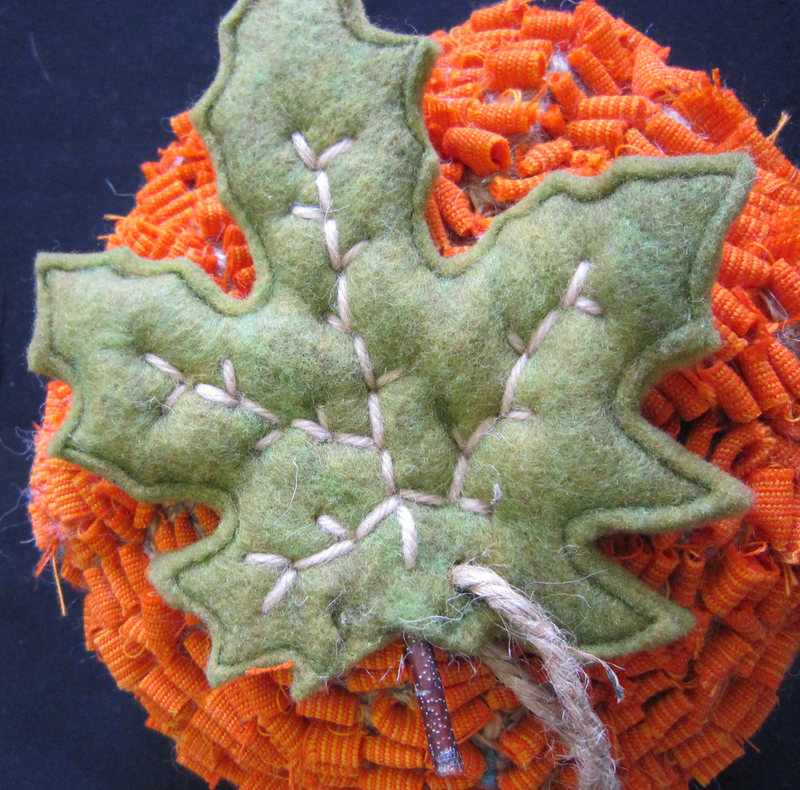 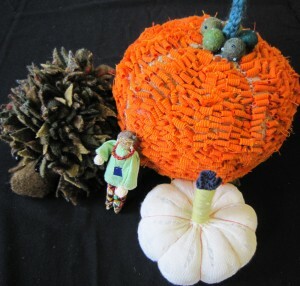 We have a suitably autumnal theme of pumpkins this month, for a mini harvest festival next month. 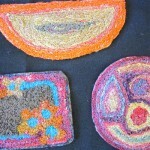 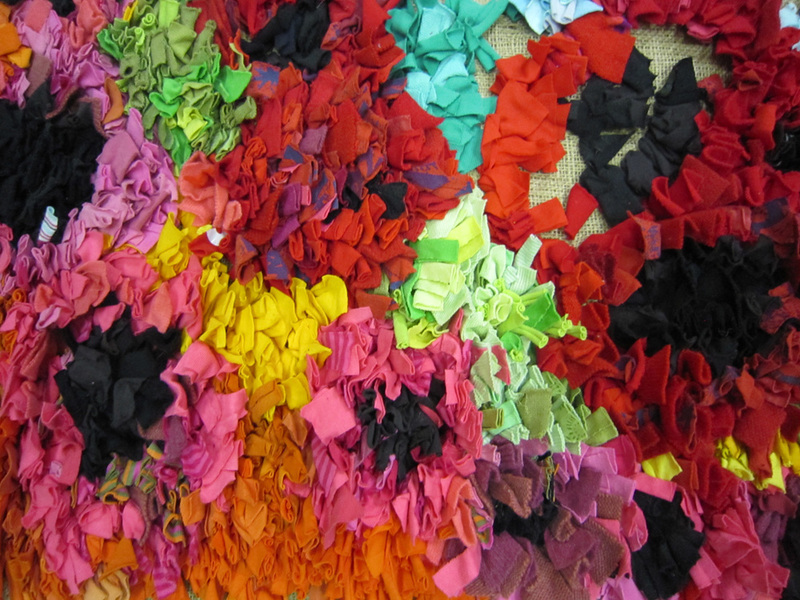 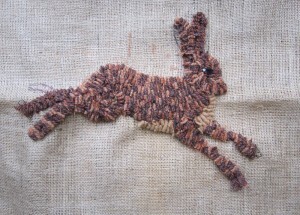 Penny rug, hooked, felt, we will see where inspiration takes the group next month. 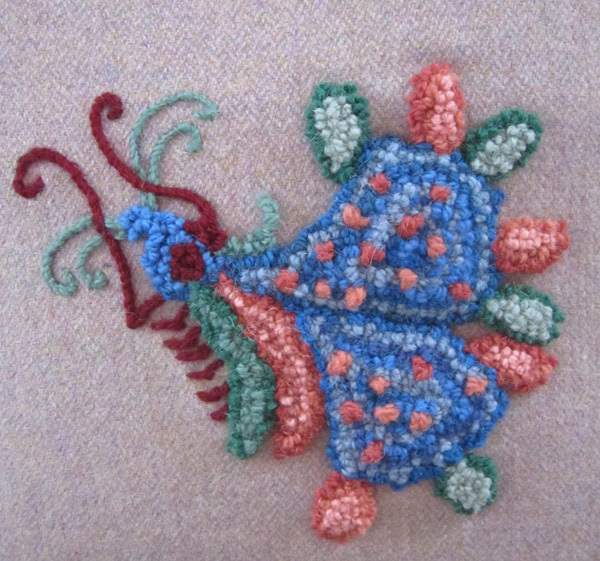 Meanwhile here are some I have made over the years. Next month we start our Christmas owl project for our Christmas exchange, so look forward to some interesting owls over the next months. 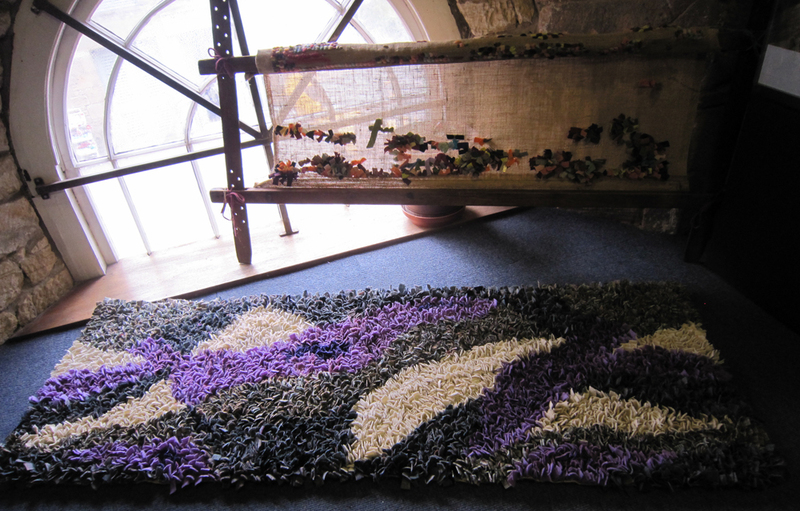 We had some lovely proddy rugs finished in time for this meeting. 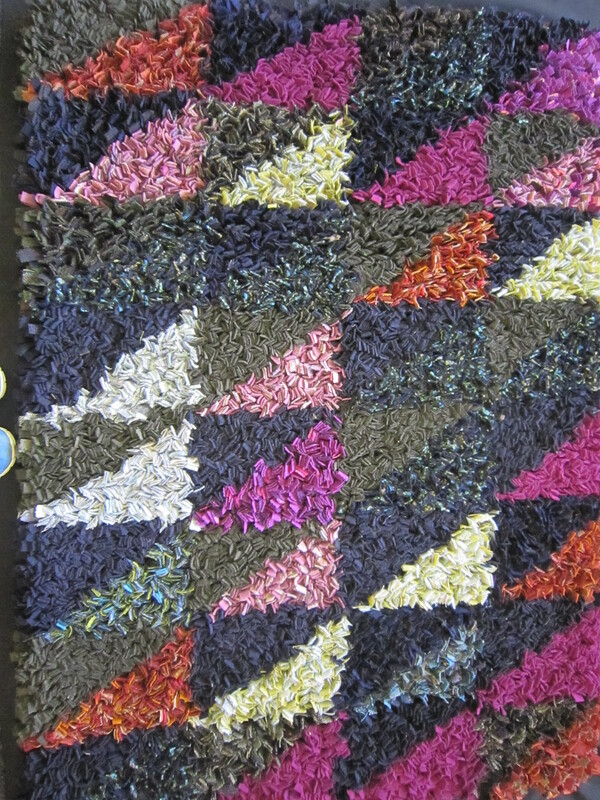 I never tire of looking at these rugs, the group are so inventive with colours and patterns. 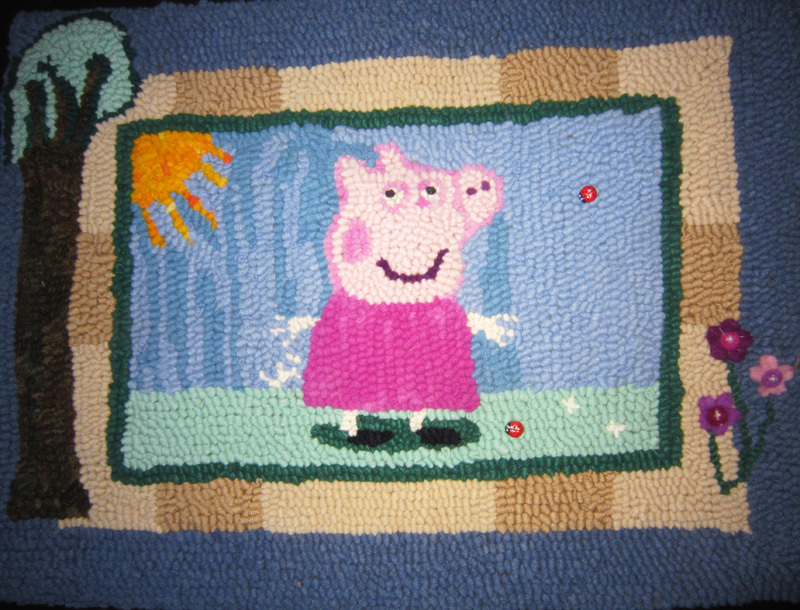 The next rug is also proddy, but made from sweatshirts and thick teeshirts. 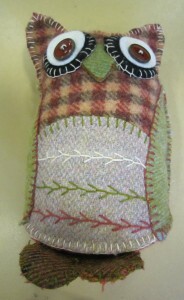 It will be a raffle prize at a local charity shop, Helping Hands in Halifax. We also had another early reminder of Christmas with this gorgeous angel. 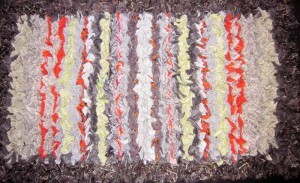 her stripy legs are made from a striped tee shirt. 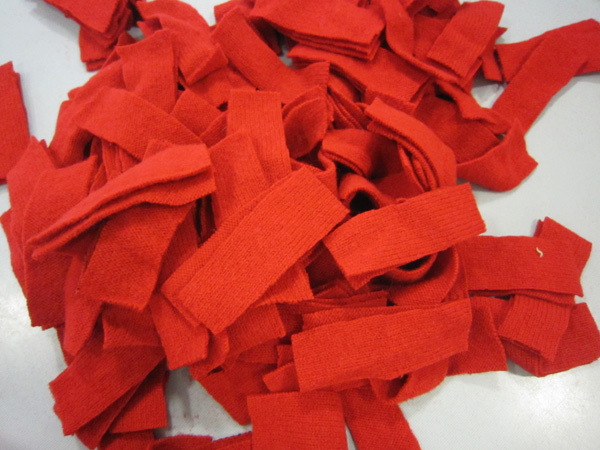 We unrolled the Bradford Libraries WW1 poppy rug to see how its going after all the summer childrens workshops. 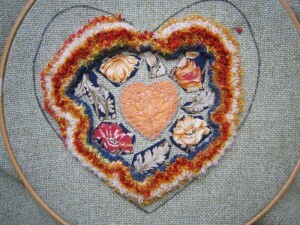 It is looking lovely, just a bit of gentle evening up to do on some of the prodded pieces. 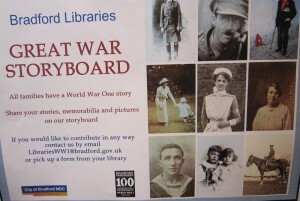 We estimate it will take the four years of the WW1 to finish! 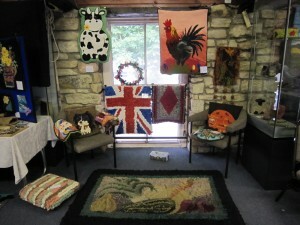 Not a meeting this month, but just sharing a couple of photos of our summer picnic. 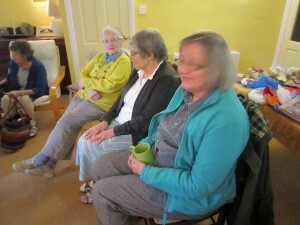 We managed half the day outdoors before the rain came down and we all took shelter. 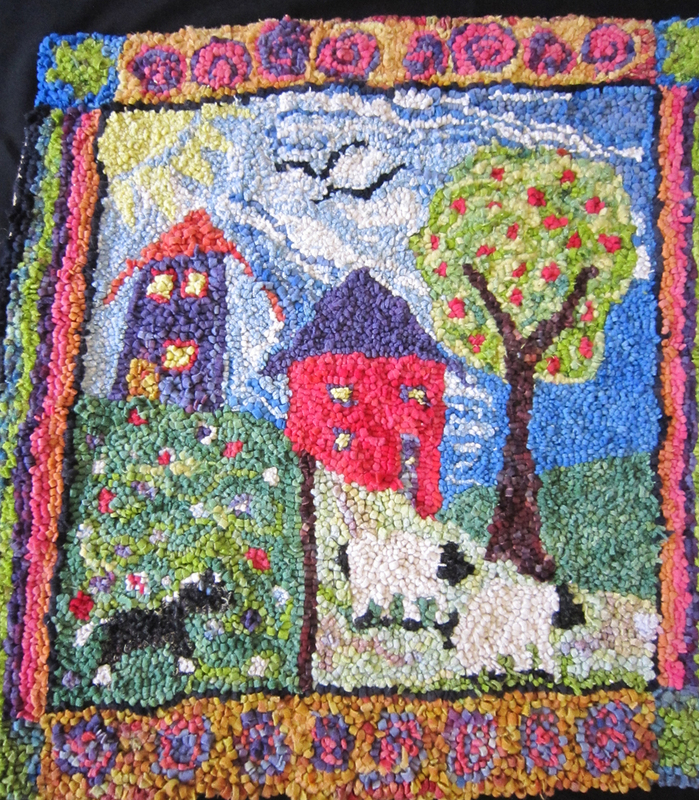 The delightful rug in the pictures is made for a window seat in a historic almshouse, the pattern comes from the architecture of a local church. It is over a metre long. 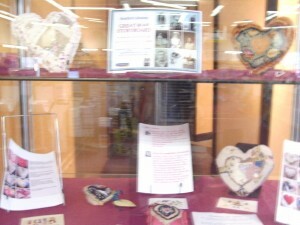 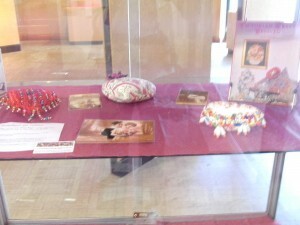 We have had an exhibition of the sweetheart pincushions at Shipley Library this summer to coincide with our WW1 themes. 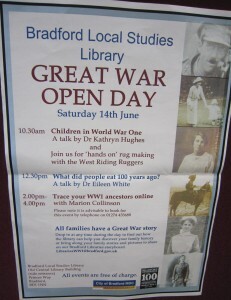 Many thanks to the libray for hosting this for us. 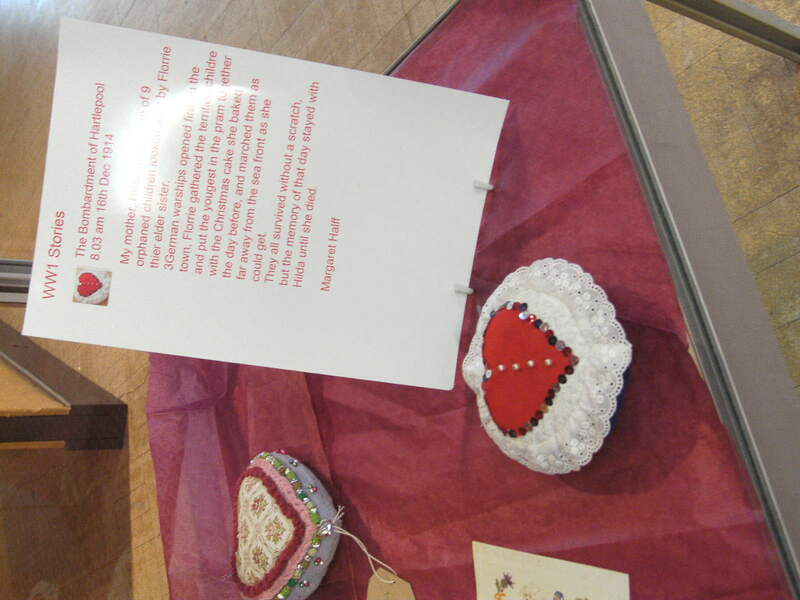 The pincushions were behind glass.. always a bit of a challenge to photograph, but this gives a flavour of the exhibition. Just to complete the “Tour” pictures, the picture withe the bike is taken outside Stones Methodist Church, the railings have all been decorated with old bikes.. hope the cyclist had time to notice them as they raced down the hill. The other picture is me wearing the headband I made at Cober Hill using the pattern out of Lynne Steins book, but adapted for the tour in yellow. 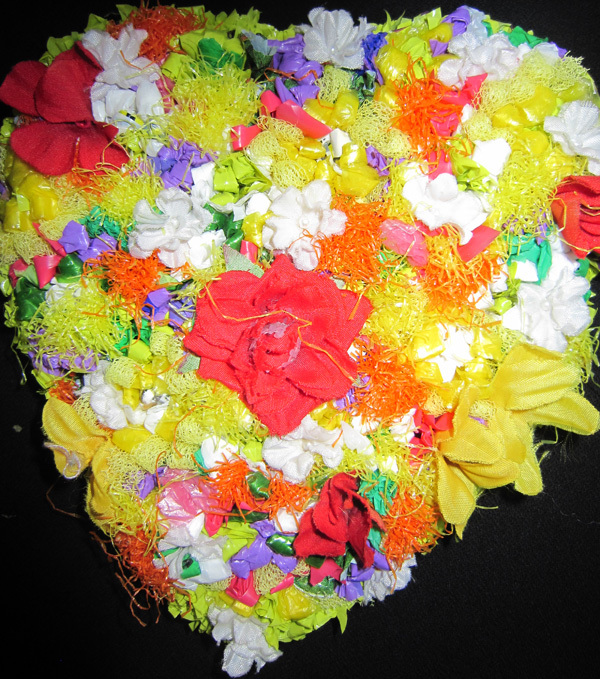 Think I will save it for weddings now. 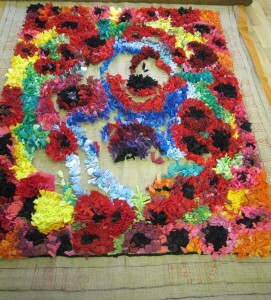 We had some lovely proddy rugs completed at the last meeting. 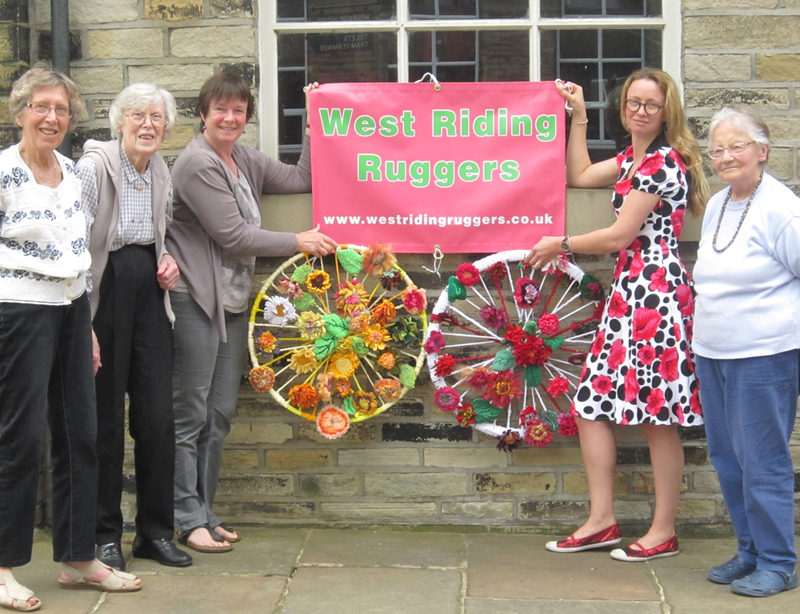 The July Meeting is our AGM, and we also raised over £50 for Marie Curie. 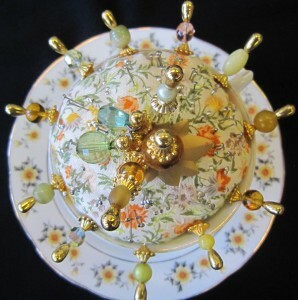 We ought to hook them a big yellow tea pot! 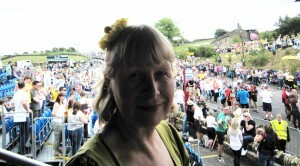 We chose the themes for next years meetings, and I will be putting the diary on the membership page shortly. 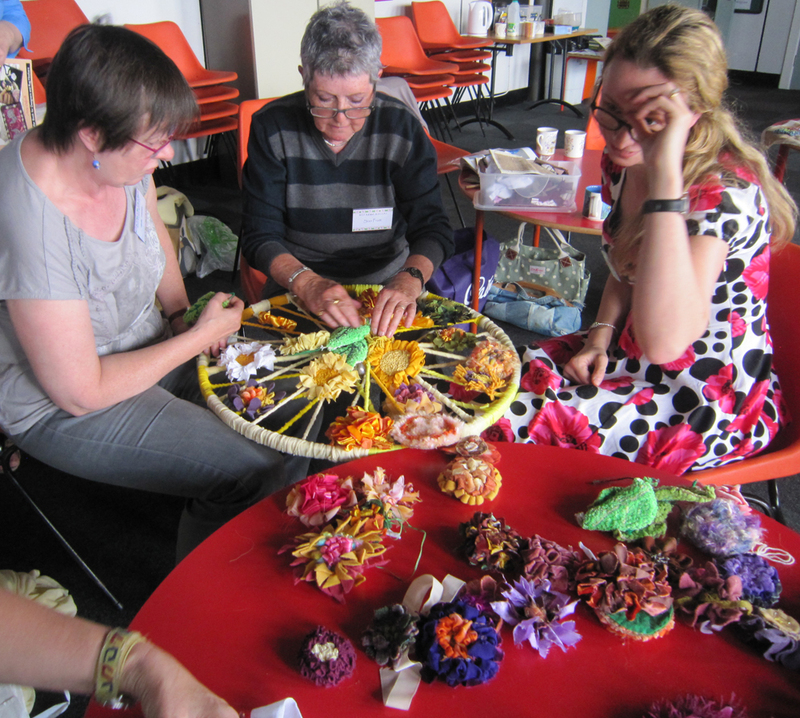 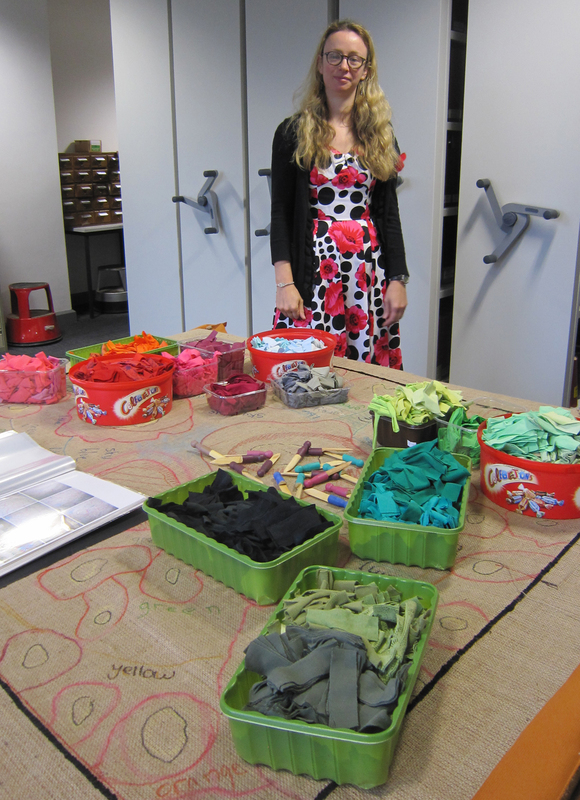 We also had a short demonstration about making felt flowers. One member brought in the wreath she had started with Gene Shephard, and there must be some scope for combining these rolled felt flowers with wool hooked flowers.. or just with a hooked background. 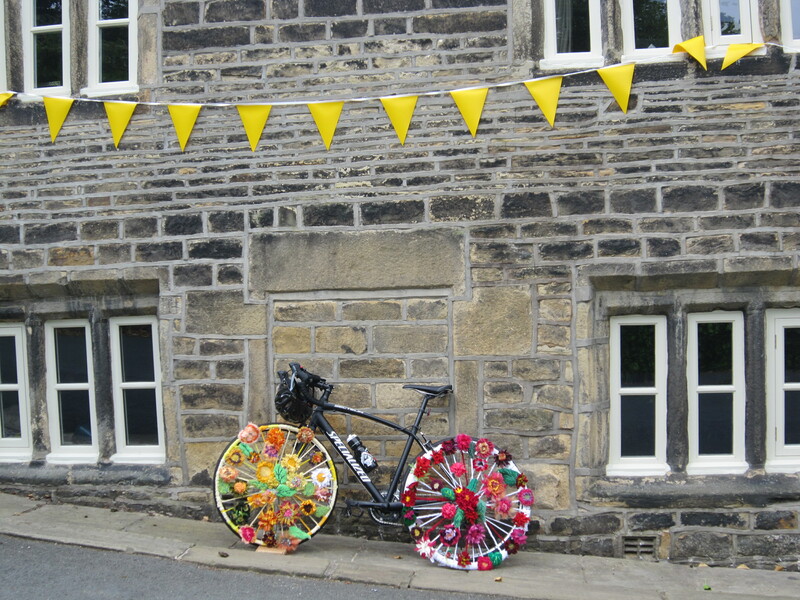 We have finished the bike wheels to celebrate Le Tour De Yorkshire, and they will be on display at Stones Church in Ripponden the 6th July. 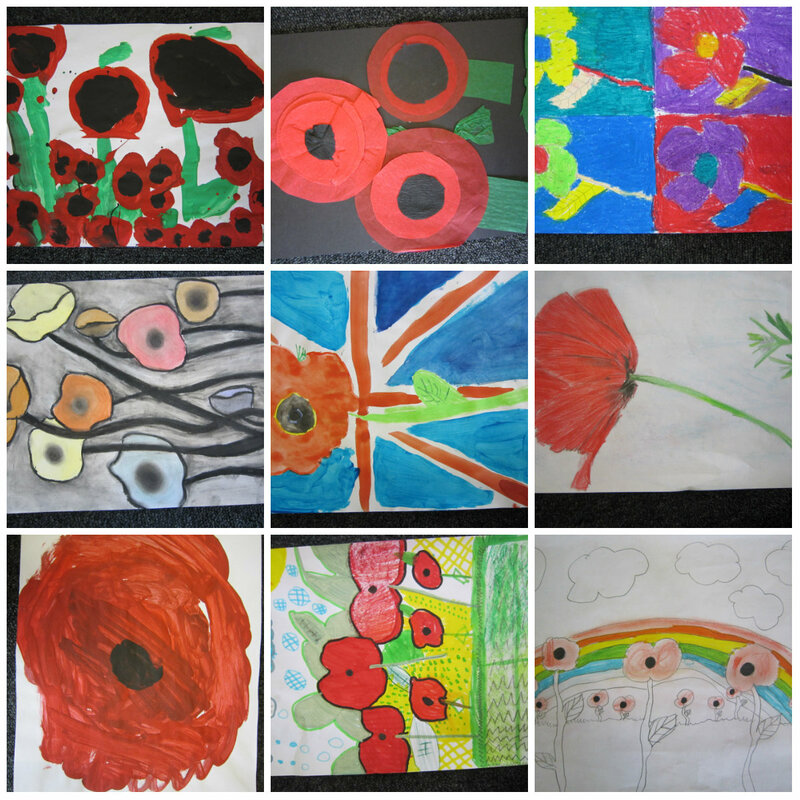 These photos are of the final stages of their completion. 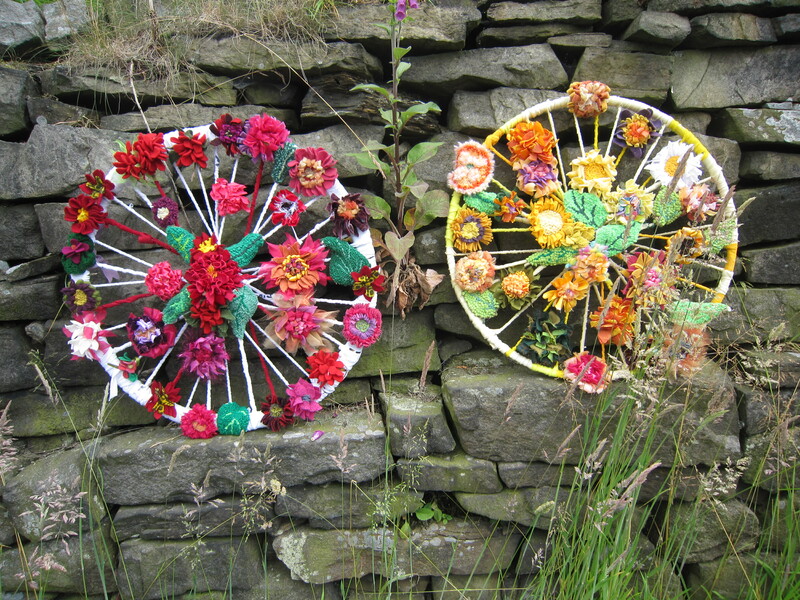 More photos to follow of them in place, but this week on a nice day I took them for a walk around our local area: they look good against our stone walls and local scenery. 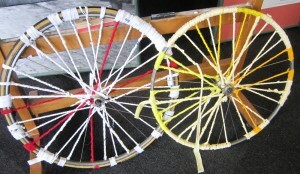 These are the wheels in front of my husbands bike. 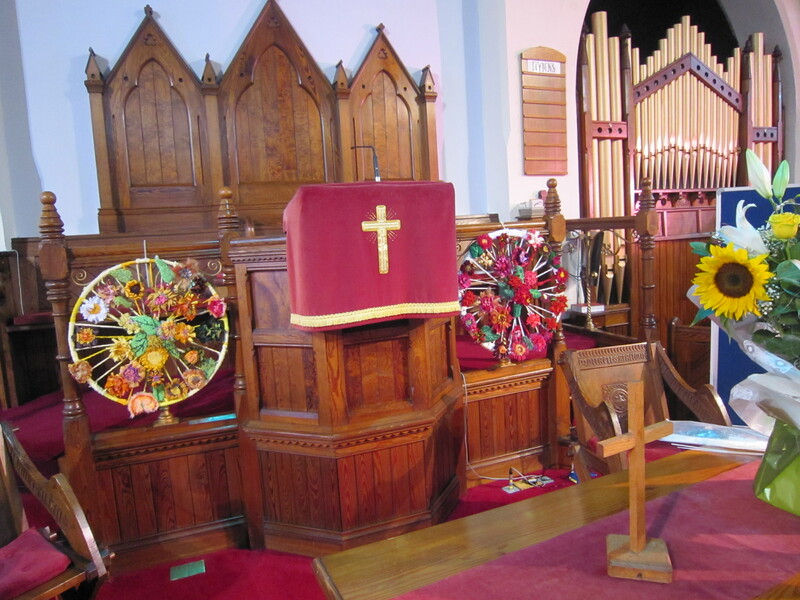 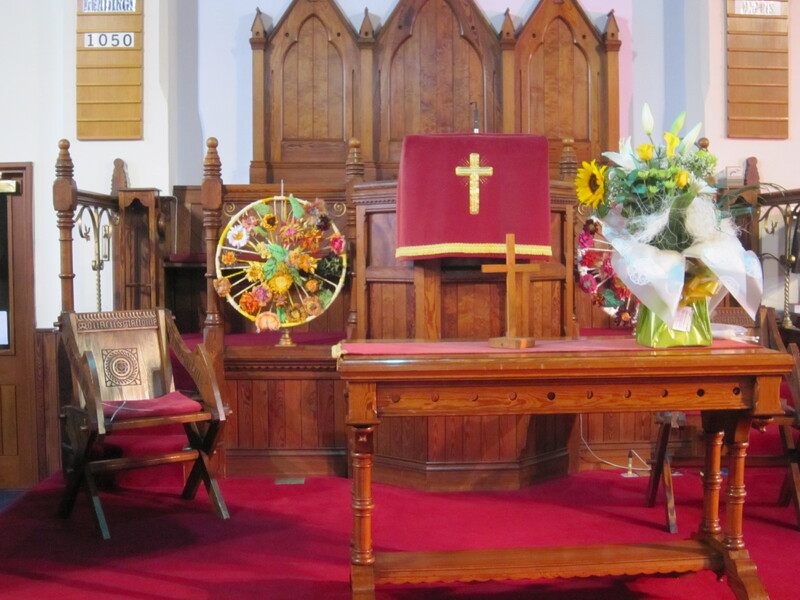 And this is the wheels in place at Stones church over the weekend of the Tour de France. 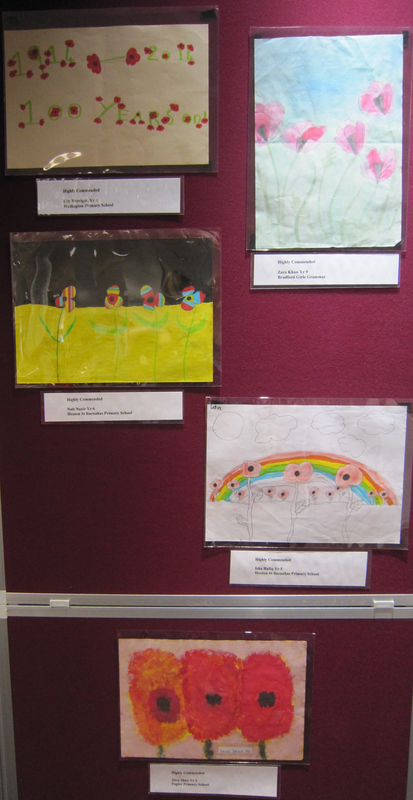 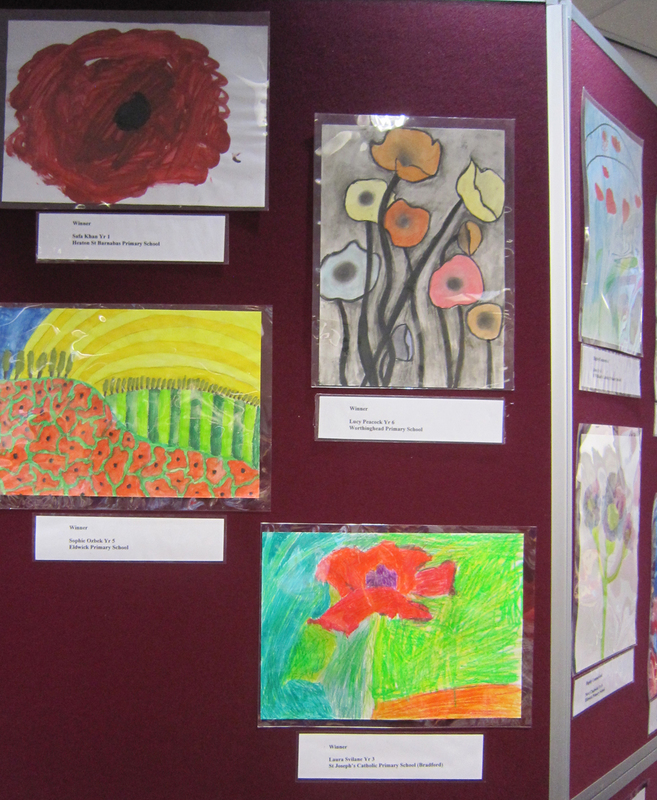 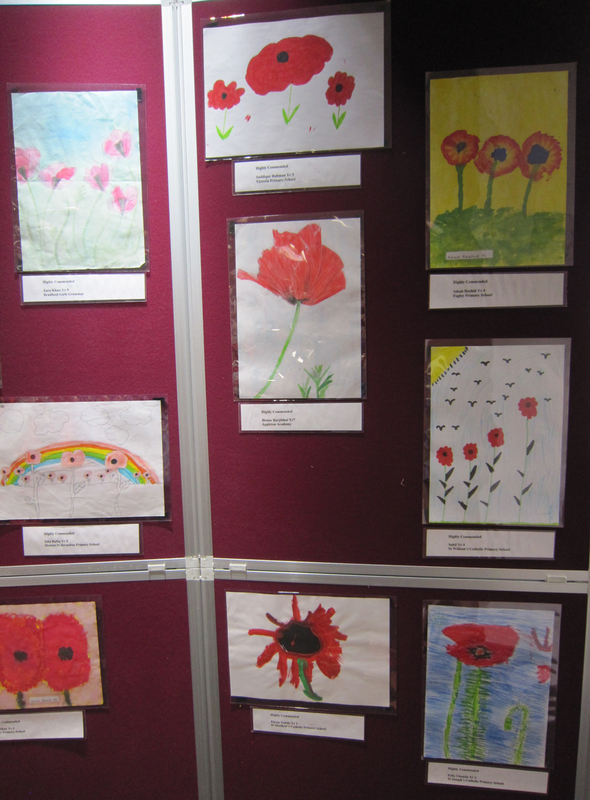 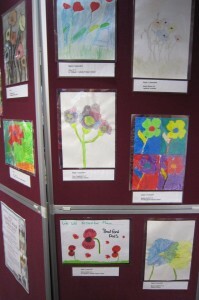 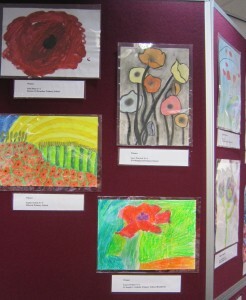 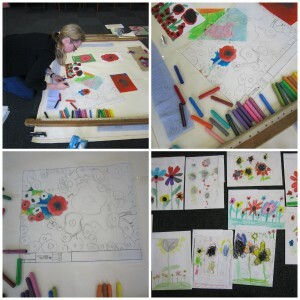 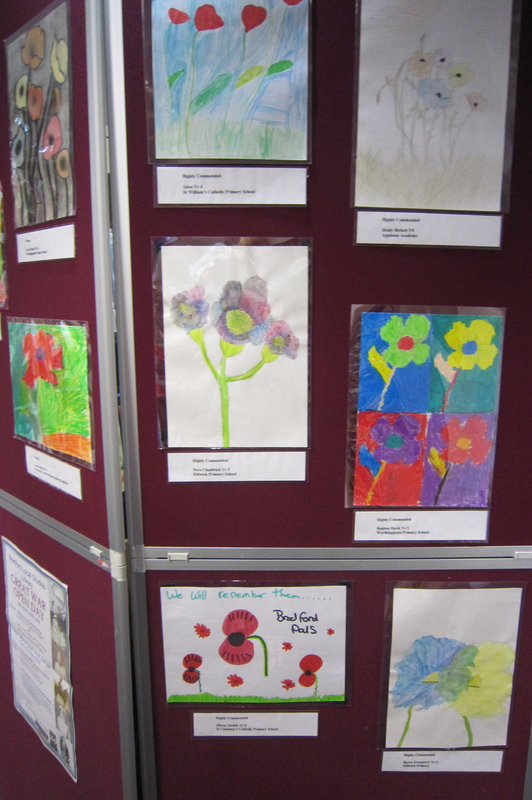 We attended the Bradford Libraries Great War open day, and met all the children who had won a prize in the Reading rug Poppies design competition. The children joined us in putting the first tabs of material into the rug. This is the design and some of the entries, and the winning entries displayed at the opening. 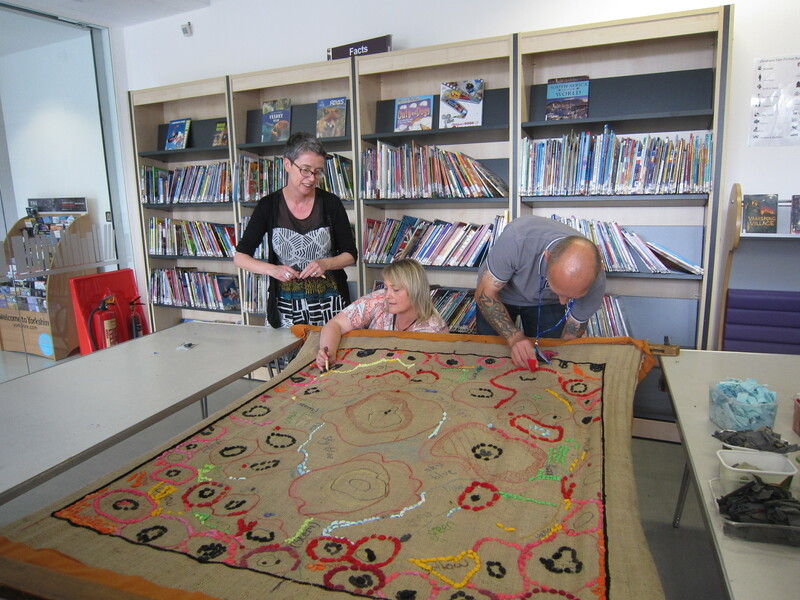 This is the rug as far as we have got after a week of about 250 children having a go.. plus the library staff from Bradford Central Library. 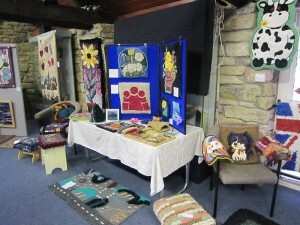 In addition some lovely new rugs and accessories were finished in time for the June meeting. 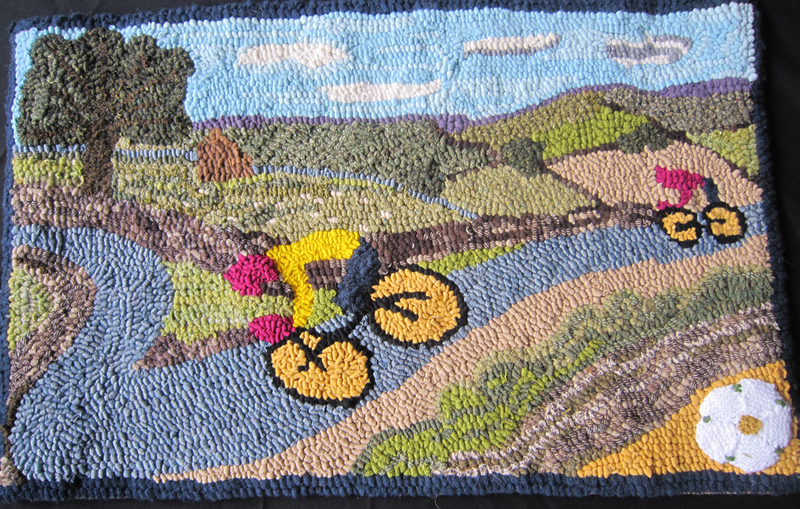 Le Tour Rug, so great. 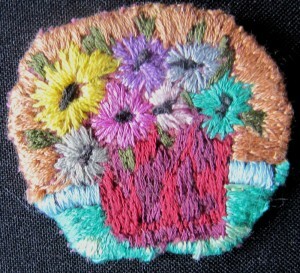 This brooch had been made in a workshop with Sue Dove. 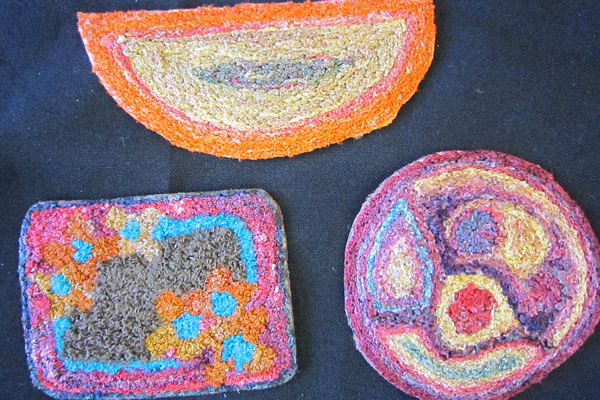 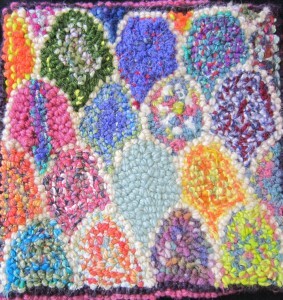 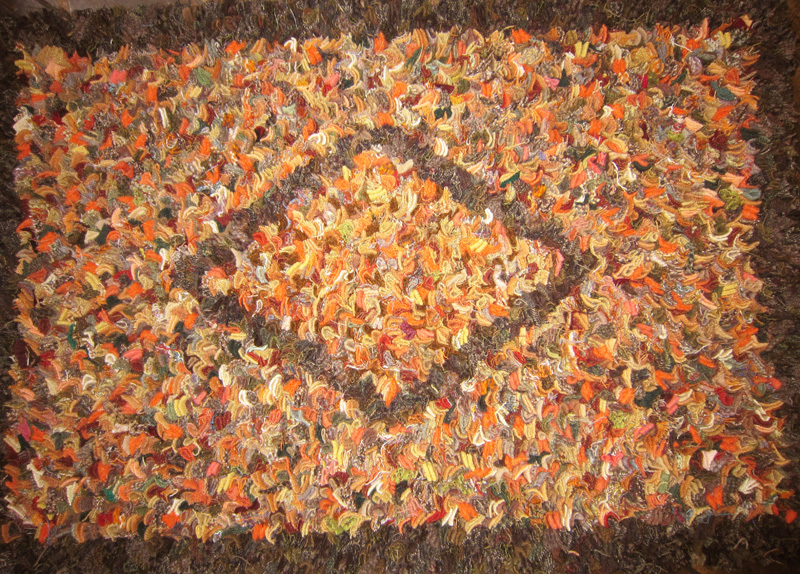 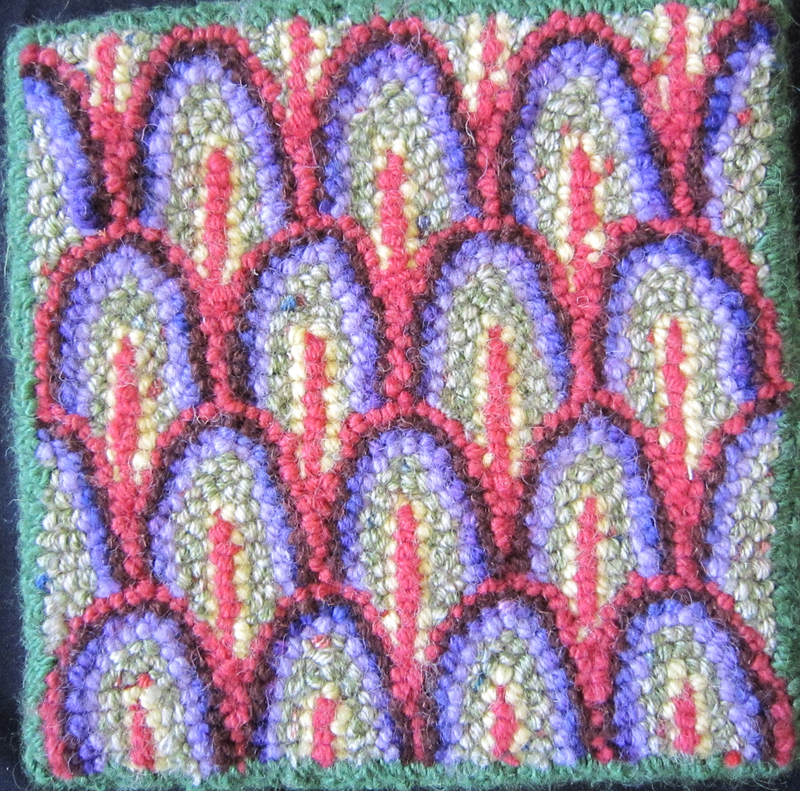 These techniques could easily be combined with rug hooking. We are always looking for new ways of making rugs. 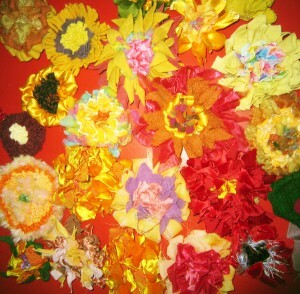 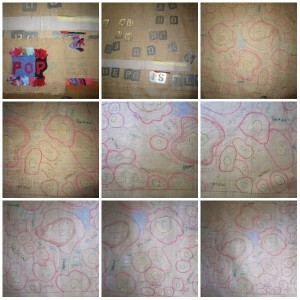 Recently I came across hundreds of instructions for making felt flowers on the internet. 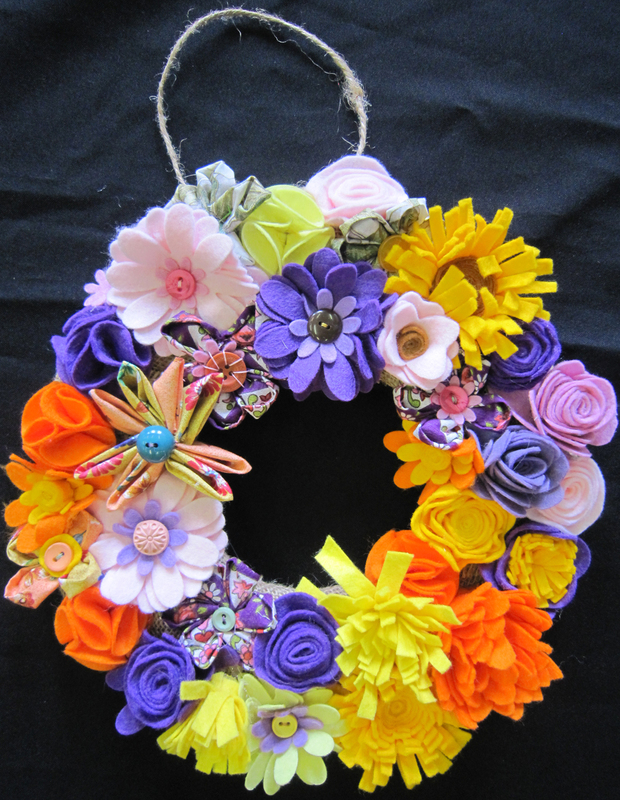 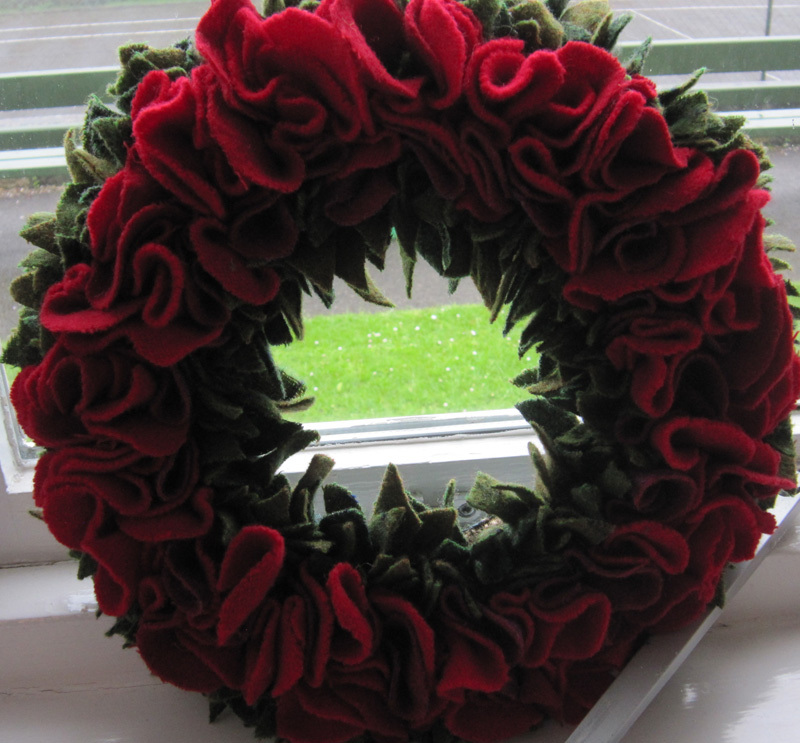 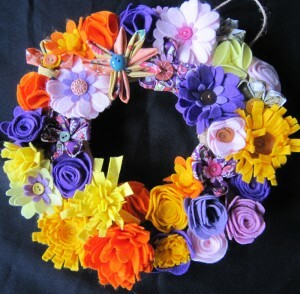 I had a go at making a wreath. 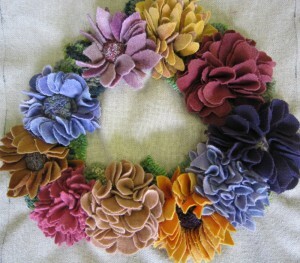 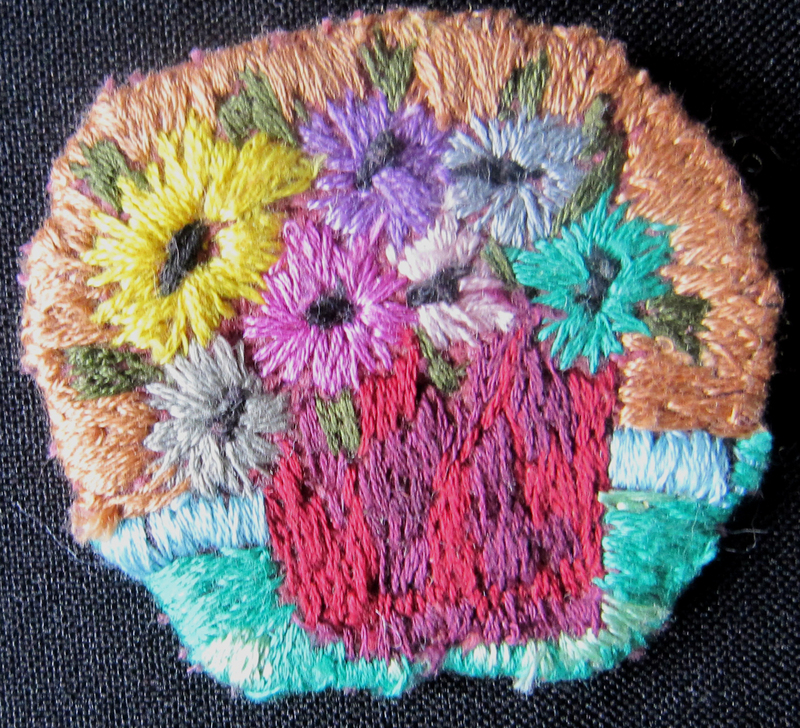 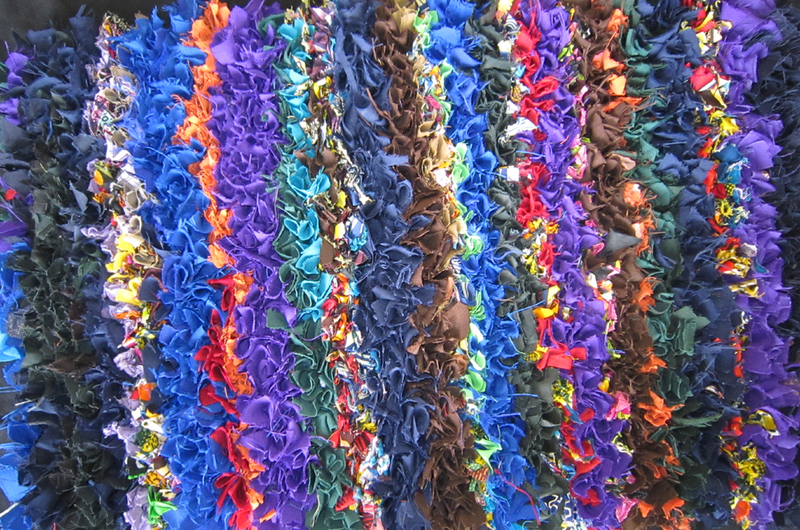 I also thought that these felt flowers would look lovely sewn in amongst hooked rugs with a garden theme. We are going to explore this a little more at our July Agm and meeting. 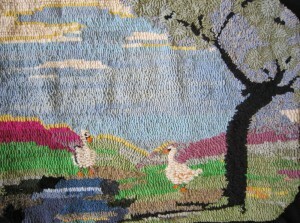 I went to see the Woodhorn Matters rag rug exhibition in the Chantry in Morpeth. It was well worth the visit, and I came away inspired by the variety of rugs on display. Their group has kindly permitted me to photograph the exhibition so that you can all see it. 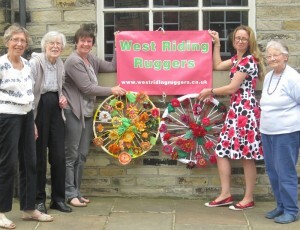 It was nice to know Ebor Ruggers had also been to see the exhibition. 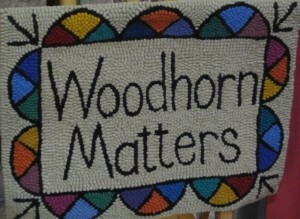 This last rug was made as part of Woodhorn Matters Millennium celebrations. 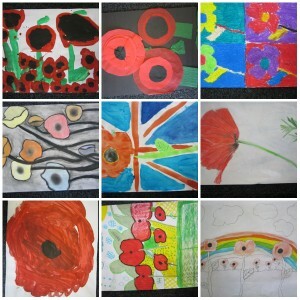 It resonated with me because of the poppies and fields background. 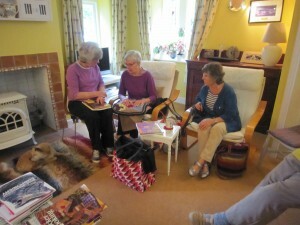 A lovely meeting with a good turn out of both long standing and new members. 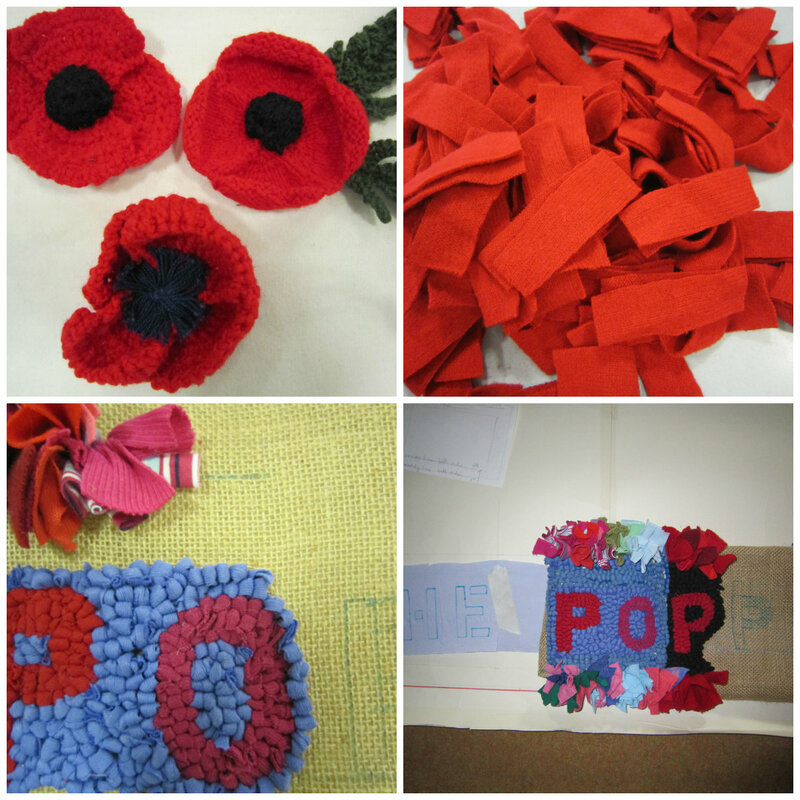 We worked on some of the administration around the poppy rug in the morning, and then the afternoon was spent both increasing the number of tabs for the poppy rug and also progressing the bike wheels by wrapping them with fabric, ready to have proddy flowers applied in June. We have an exhibition of the world war one pincushions we have made in july. 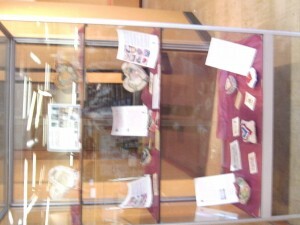 Full details of the exhibition to follow. 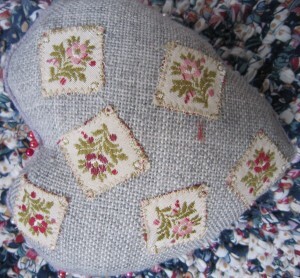 Meanwhile a few more completed cushions. 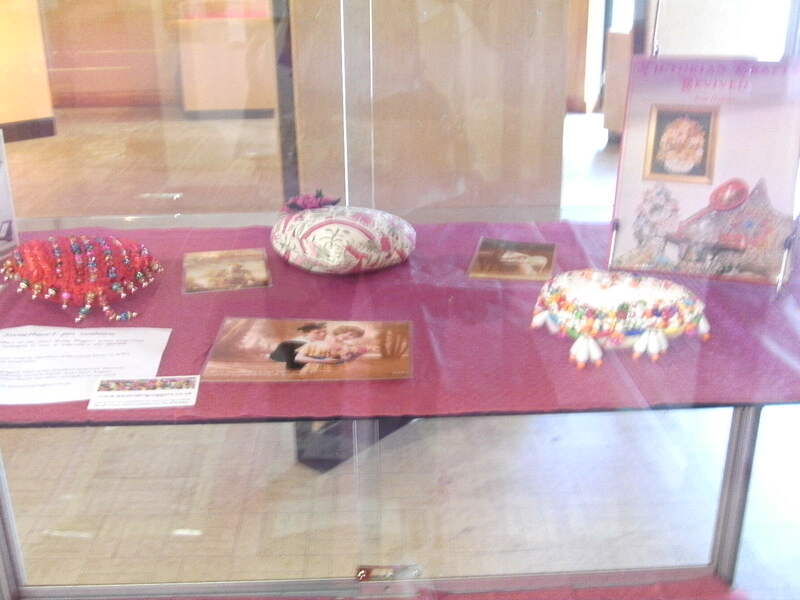 We ran out of time to show and tell these, so maybe next month. 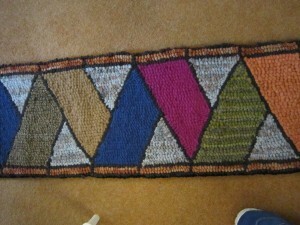 One of our group has just been to Africa, and brought this lovely African rug to show us. 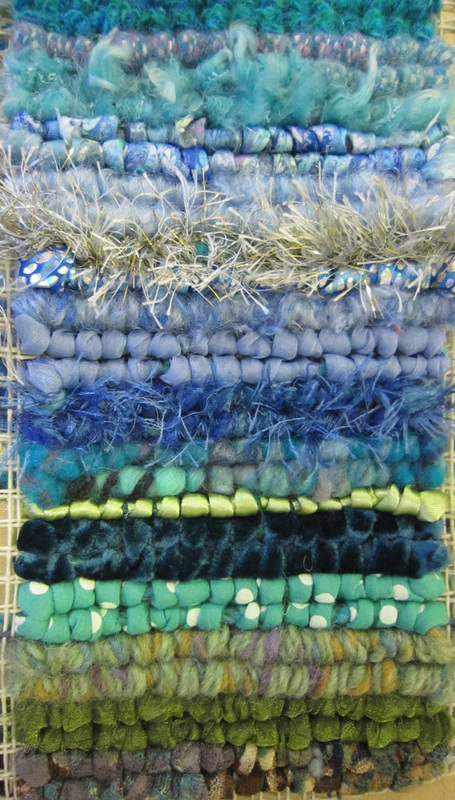 It is all sorts of materials, all prodded onto a plastic woven feedsack. 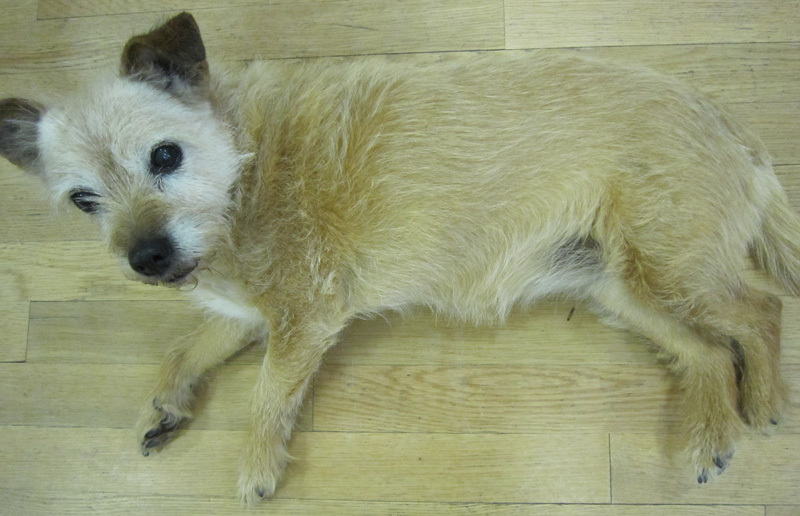 Tess joined us, she is looking as if she cannot wait for somebody to draw around her and make a rug! 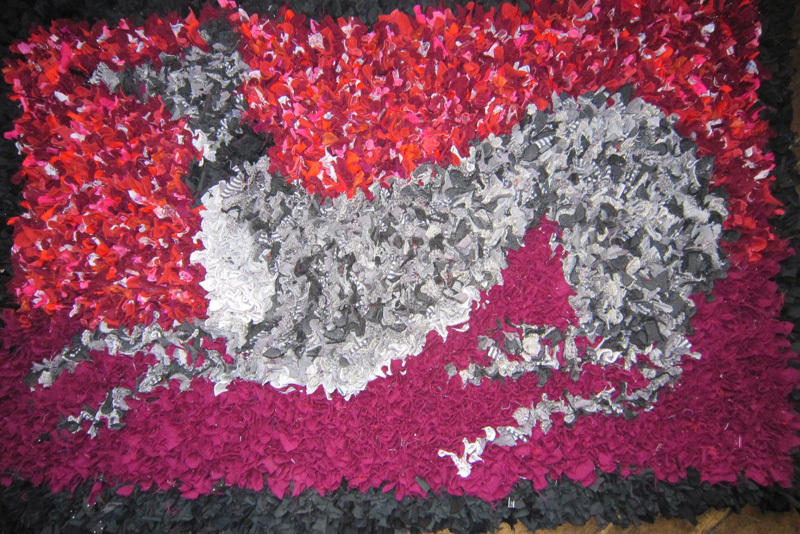 The photo below shows all the rugs at the end of the weekend, more photos of the individual rugs below. 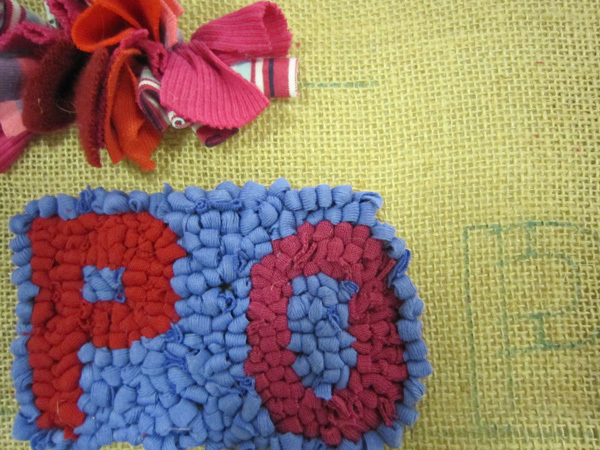 The lettering is worked out now, and a small sample has been started. This is the start of lettering for a different rug. 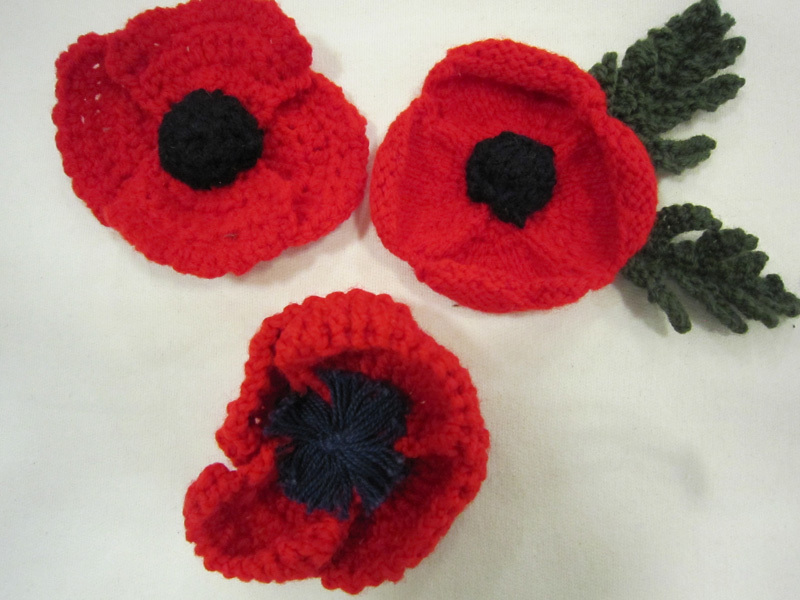 We are all planning to wear poppies when demonstrating rugging and have decided they may be knitted or crochet as well as rugged. 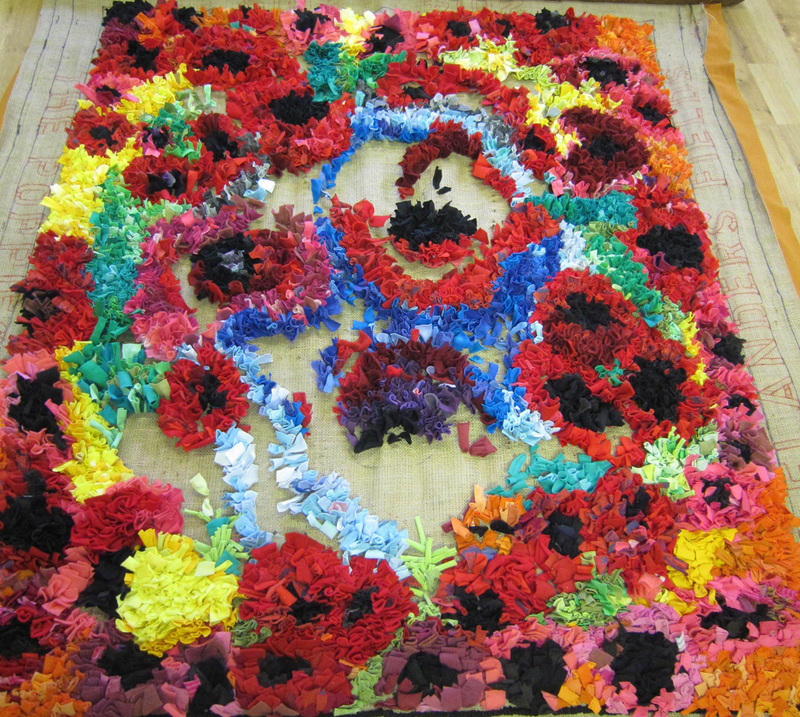 Still on the poppy theme, these poppy and remembrance rugs are being made for an exhibition at a National Trust property. 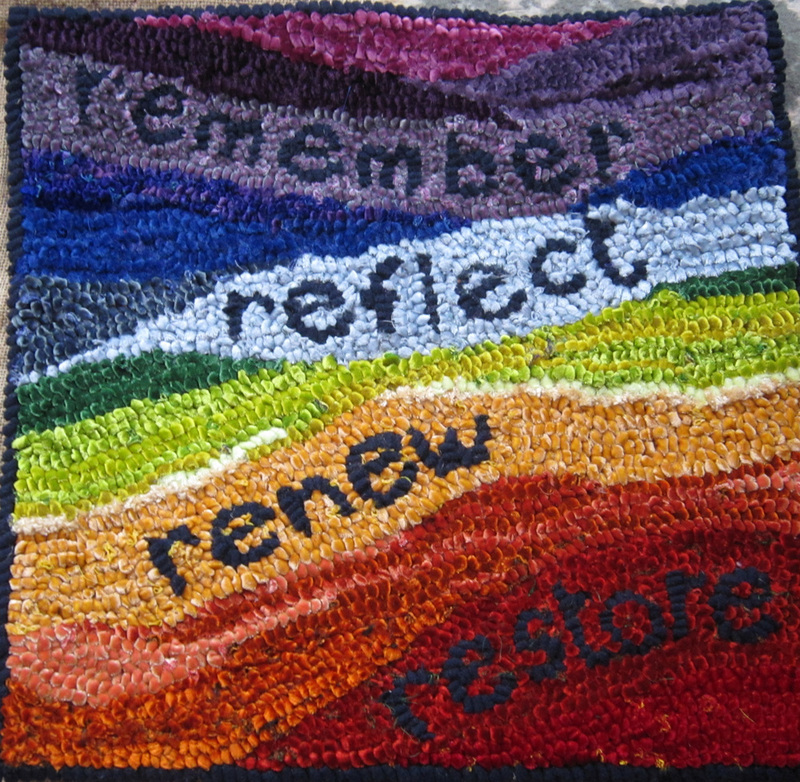 The wording on the first rug then relates to the designs for the following rugs. 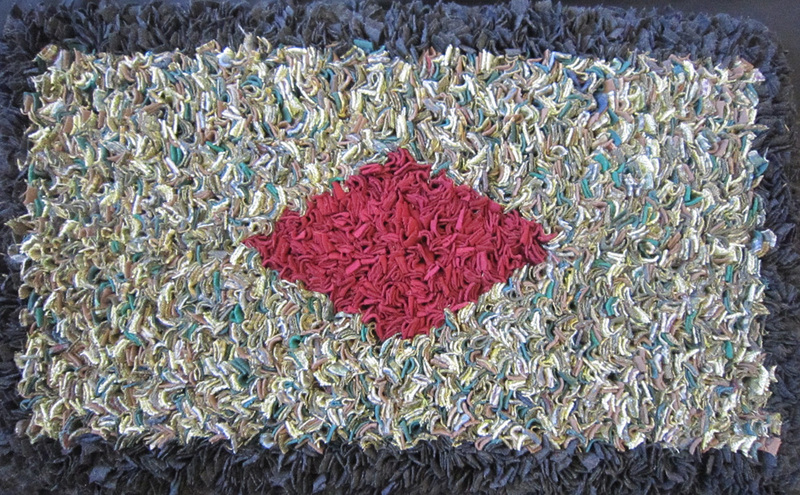 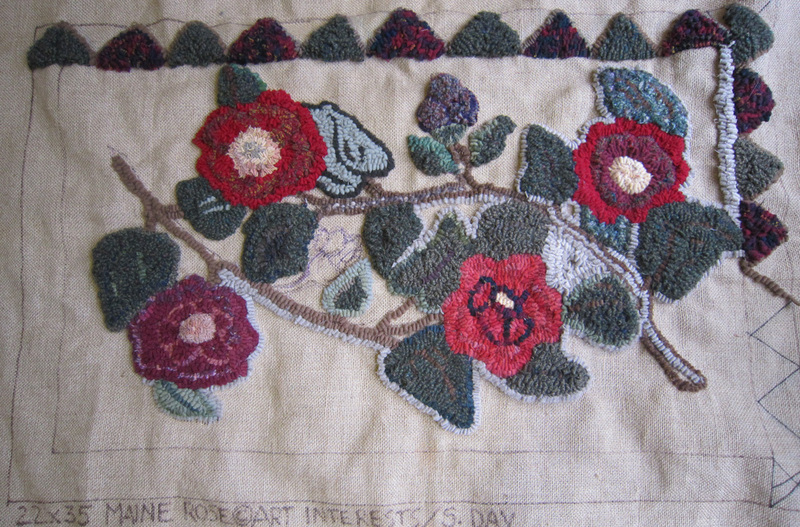 Another rug, which is slowly progressing due to the narrow strips also features red flowers, but used in a different way with hooked and shaped centres. 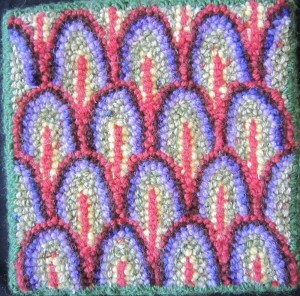 This is hooked from an American design as shown on the rug. 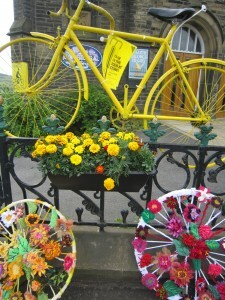 The other big event in this area is of course the bike race in July. 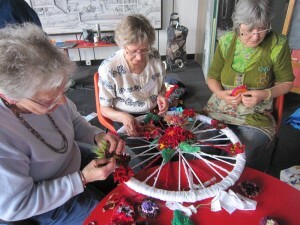 As a group we are decorating bike wheels, but her are a couple of extra projects to celebrate the “Tour”. 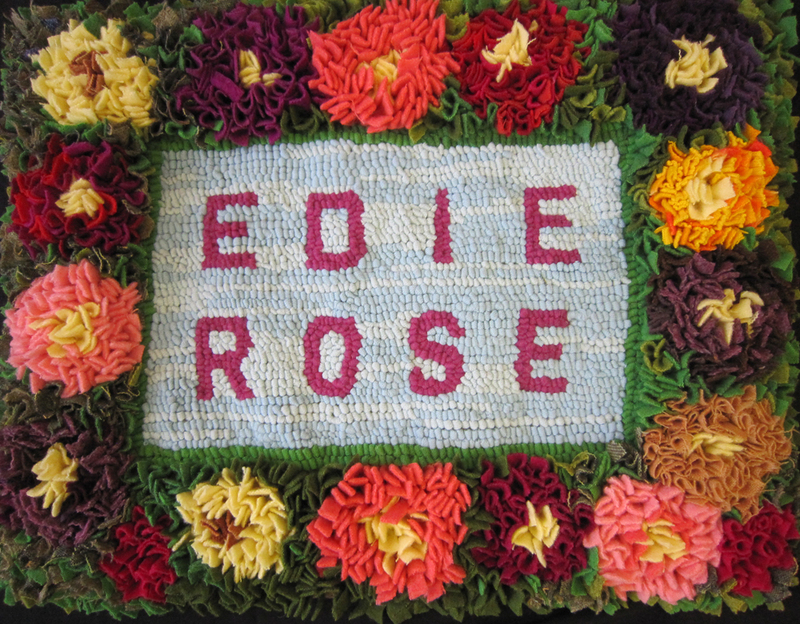 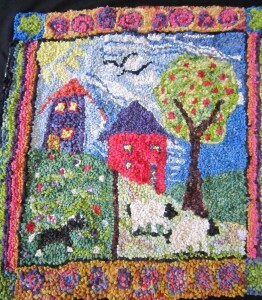 The first rug is to display in Ripponden close to the route. 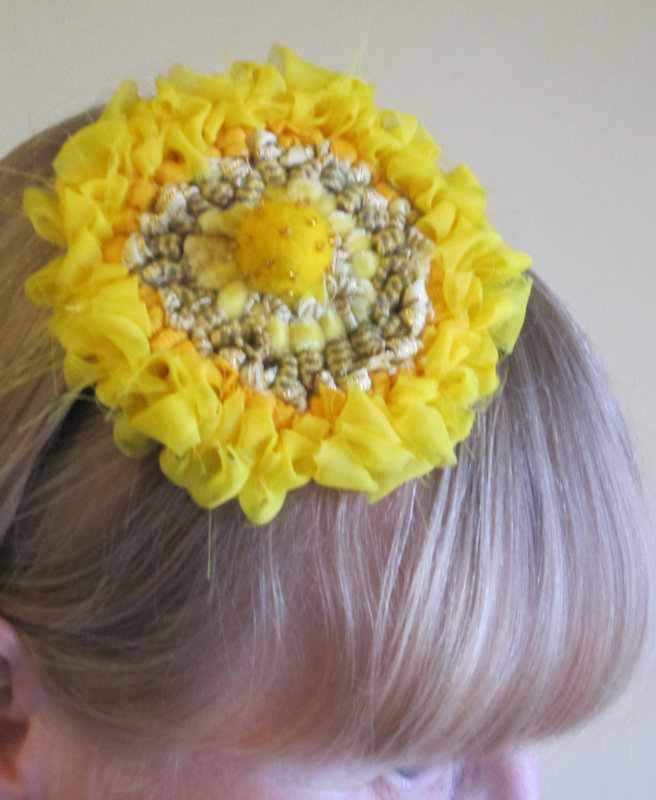 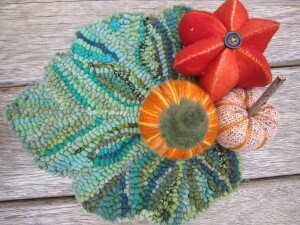 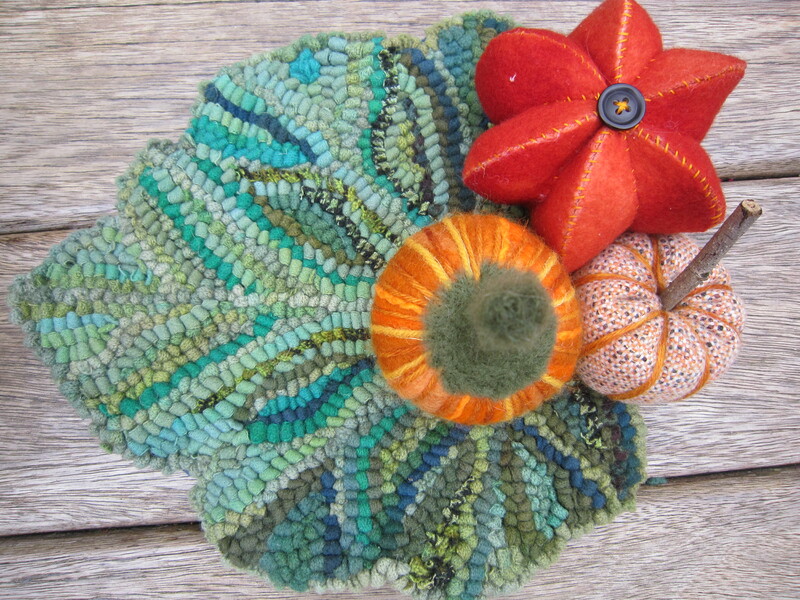 The design for this hairband/fascinator is featured in Lynne Steins new rug book. 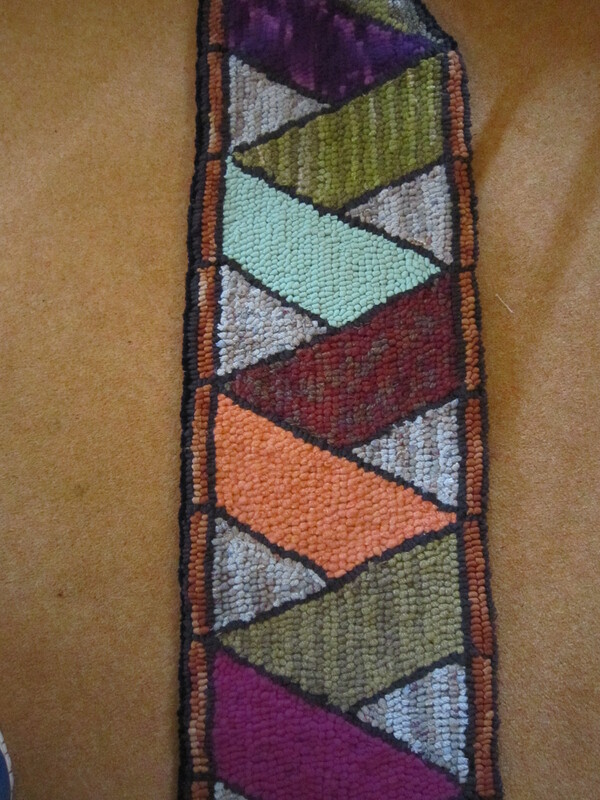 I have made one to wear on the day..
We also have two locker hook pieces in progress, one a big rug in tweeds, and the other a small sample using mixed media. 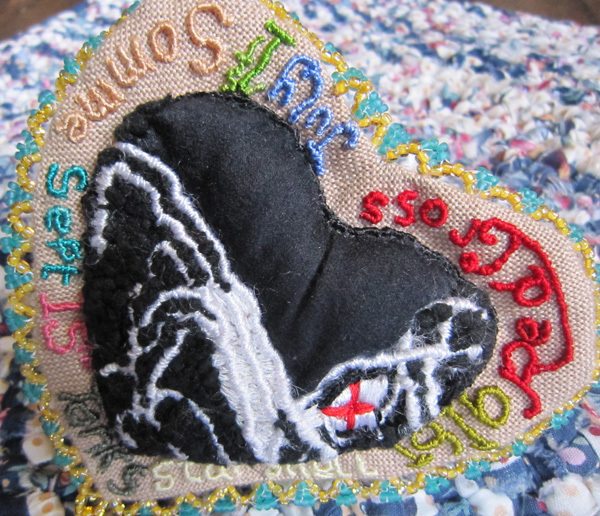 Finally our collection of WW1 inspired pincushions continues to grow. A small and select group for this meeting, with lots of members away for Easter! One new sweetheart pincushion for the collection, we hope to display these at Bradford Library later in the year, as part of their WW1 remembrance. 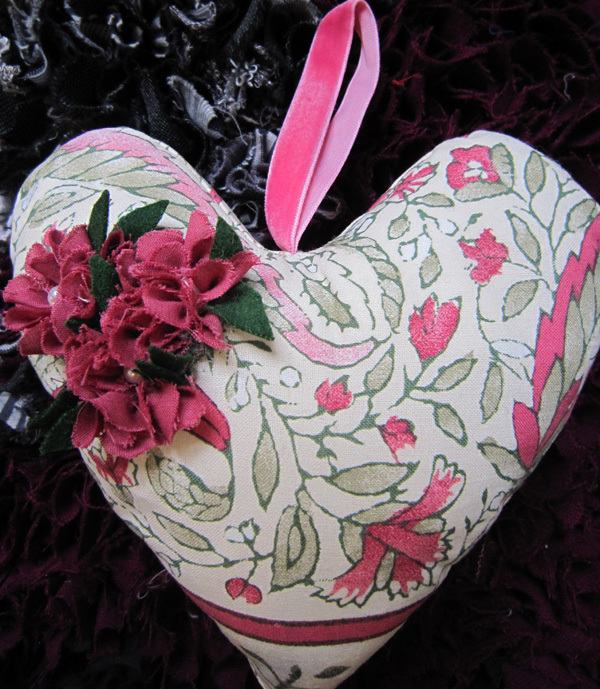 The cushion is made from vintage fabrics with special significance to the maker. 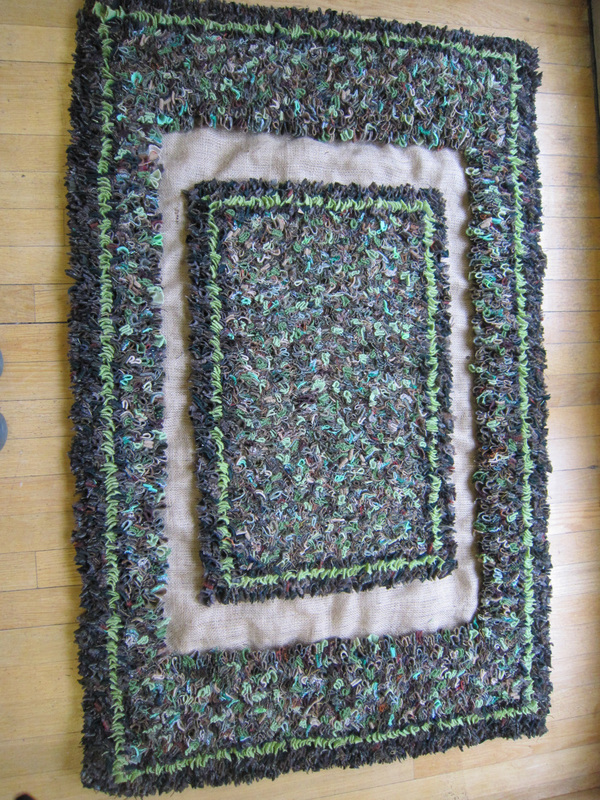 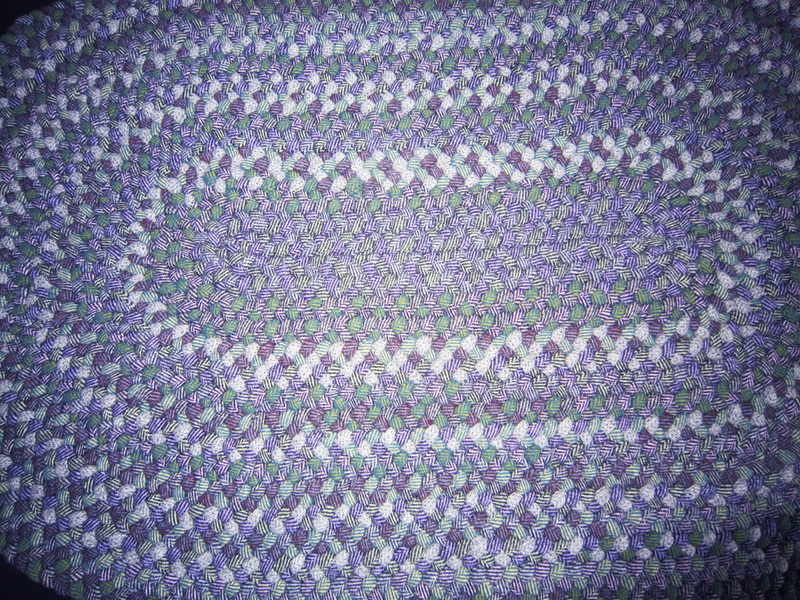 And a braided rug, all in wool. 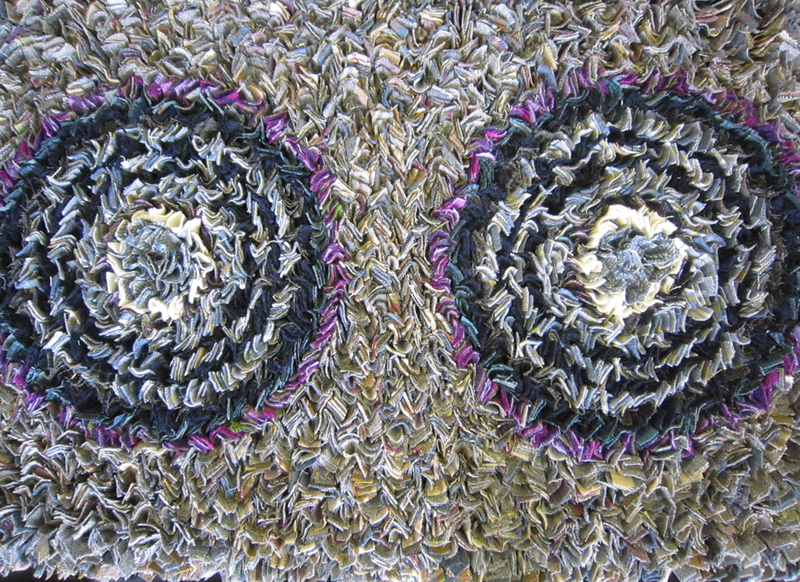 It is fully reversible. And another rug in prodded wools. We have been continuing to collect Tee shirting for the Bradford Library Rug, and thought it would be good each to wear a poppy when demonstrating. 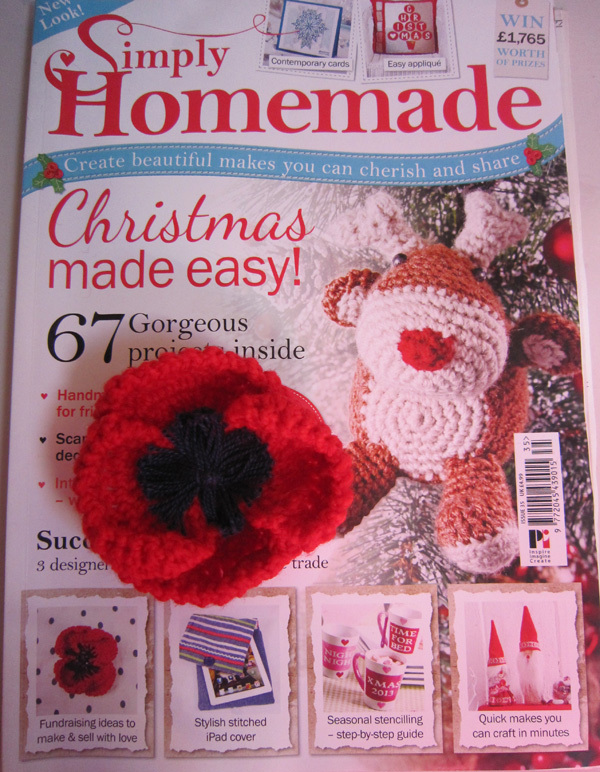 Some patterns were handed around at a previous meeting, and I recently remembered that there was a pattern in issue 35 of Simply Homemade. So this is the first completed poppy. 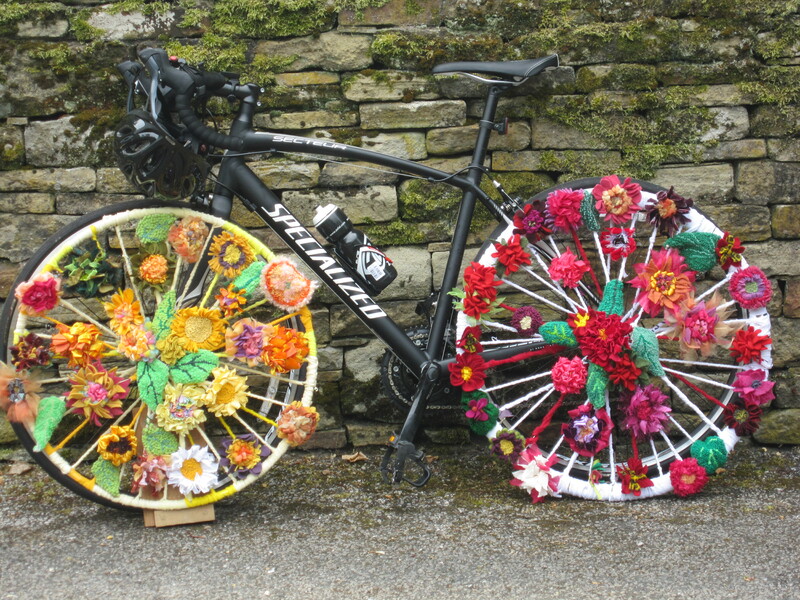 We have been donated two Bike wheels for our “Tour de Yorkshire” art work. 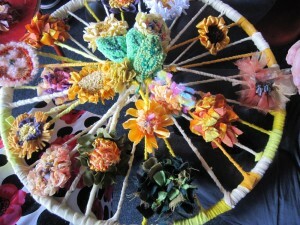 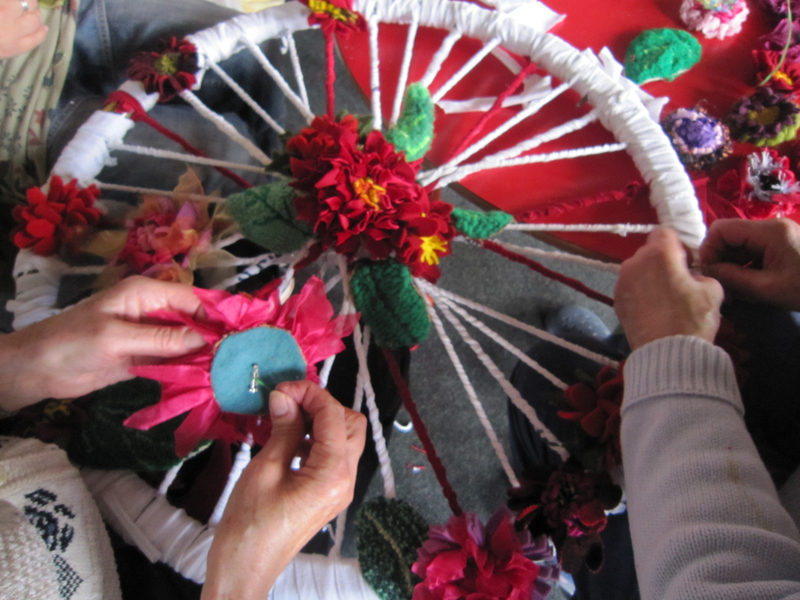 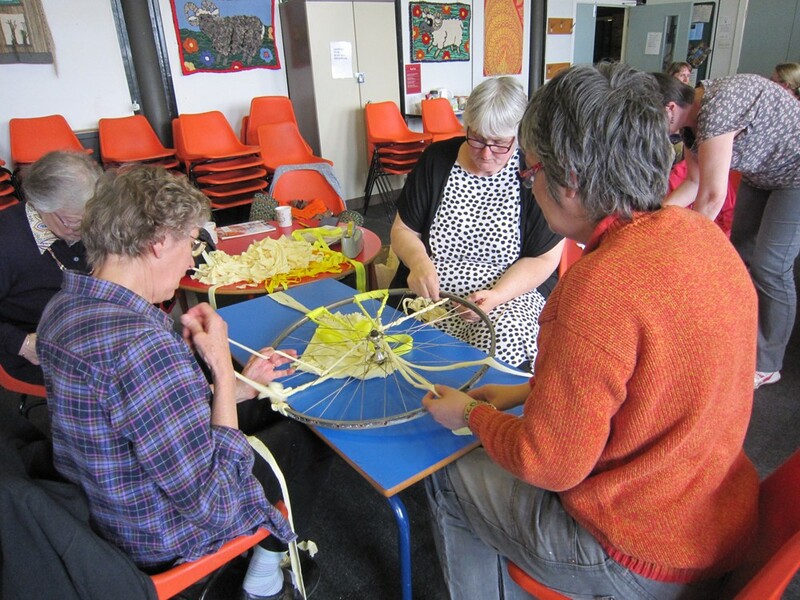 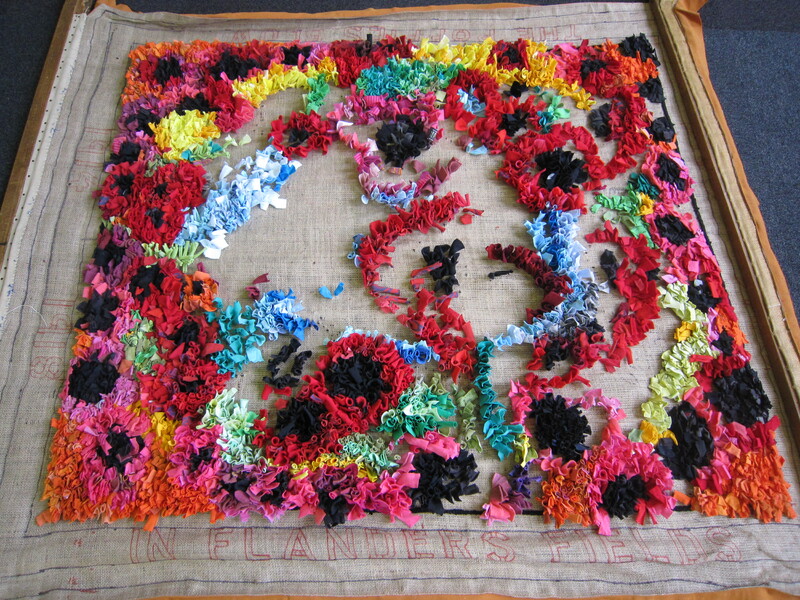 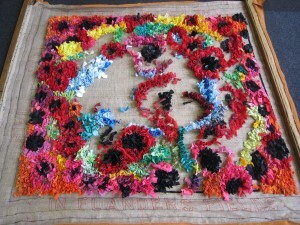 We are going to weave the spokes and add lots of rag rug flowers. 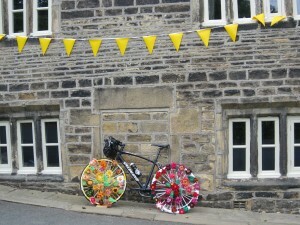 We hope to display the wheels along the route in Ripponden. 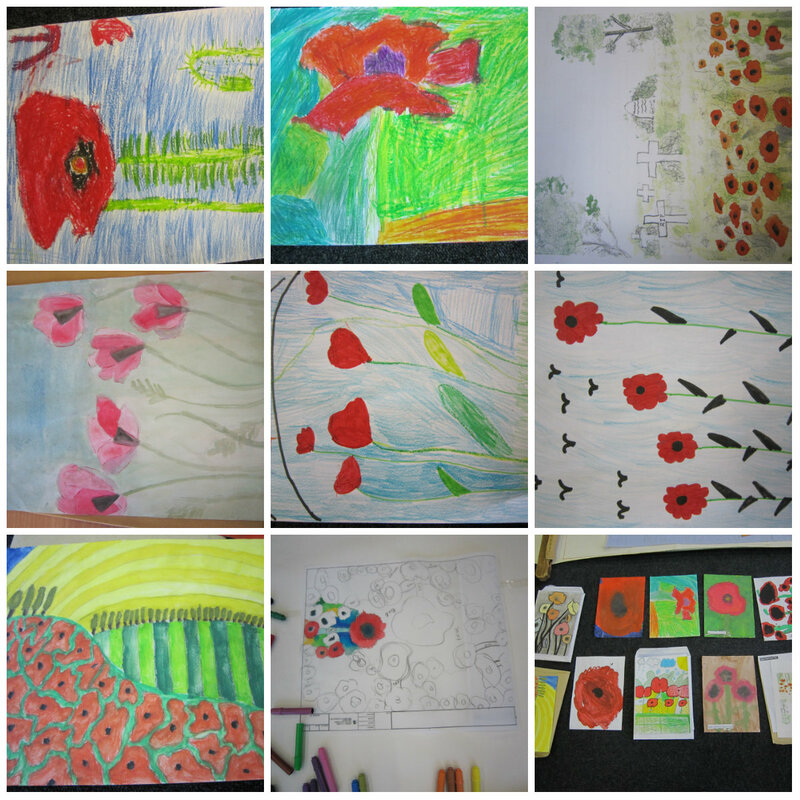 These are some of the already completed ones. We had a lively meeting this month, we were down in the old cafe area, as there was a big event going on upstairs. We managed to start sorting out all the tee shirt material for the Bradford library rug, and everybody has taken a bag of material home to cut up. 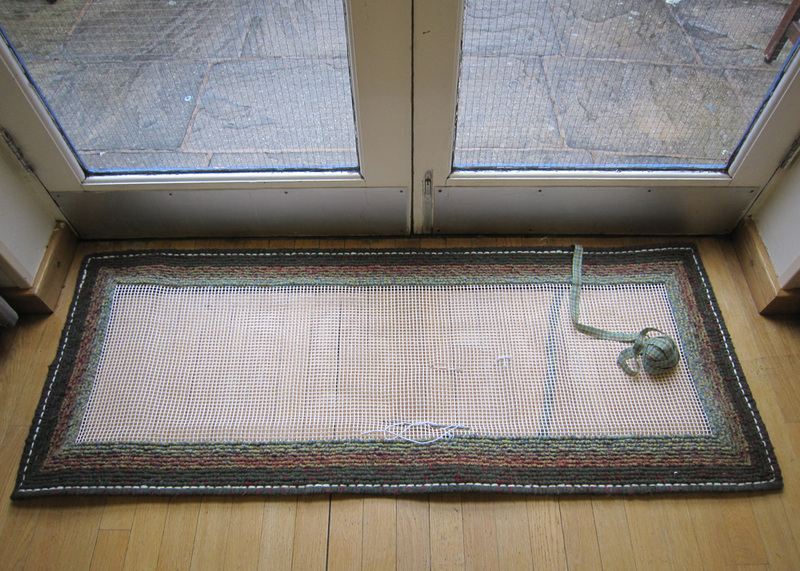 We now have frame, pegs and hessian ready for the rug once the design is sorted, and stencils for the wording around the edge. 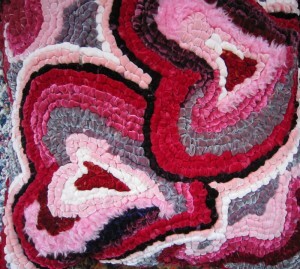 In the show and tell we saw a mixture of finished hearts and other rugs. 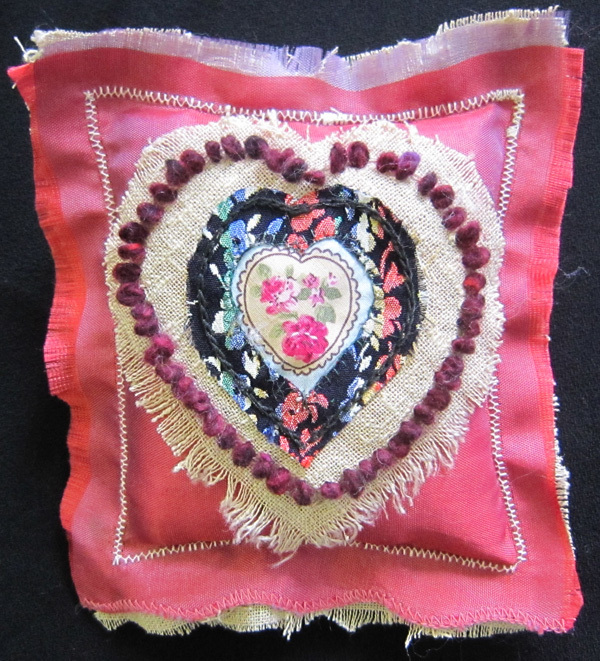 From left to right, the first heart has a hessian base layer, and cotton cover, with a hole in the cotton to prod the petals through. 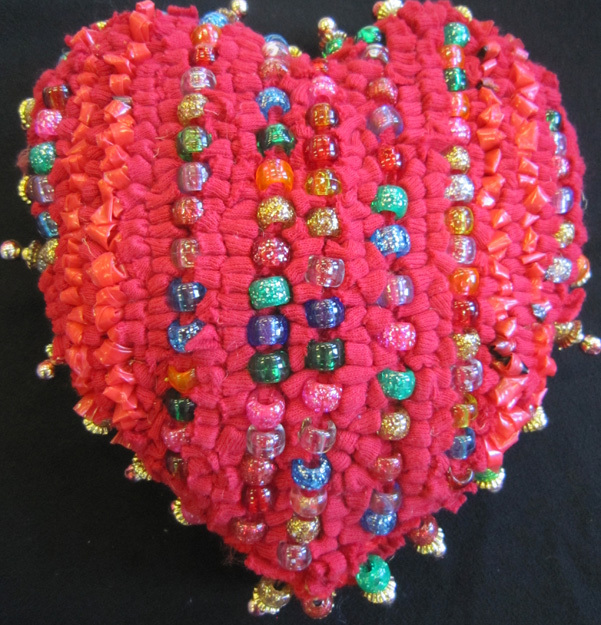 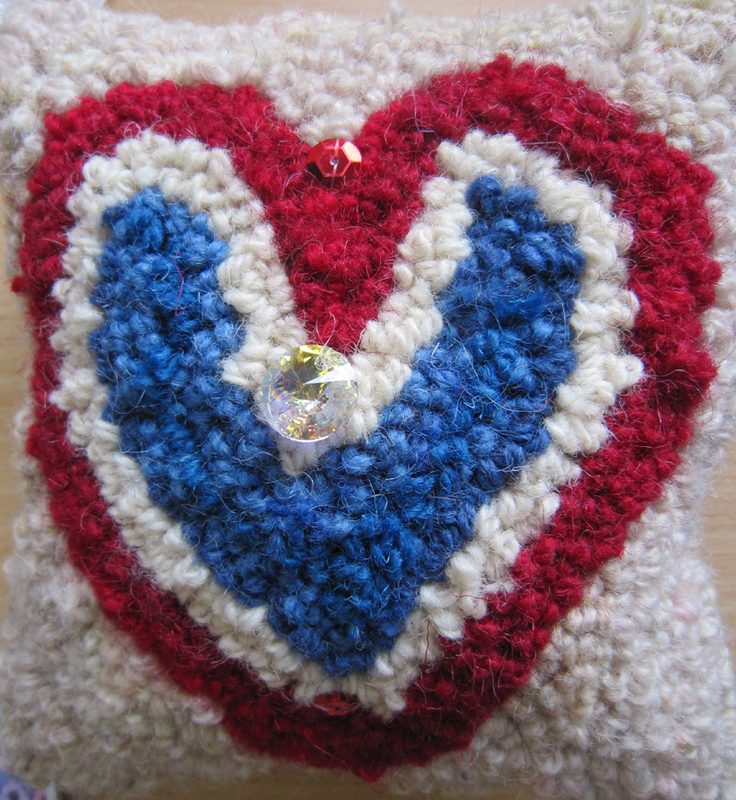 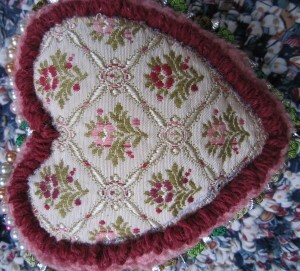 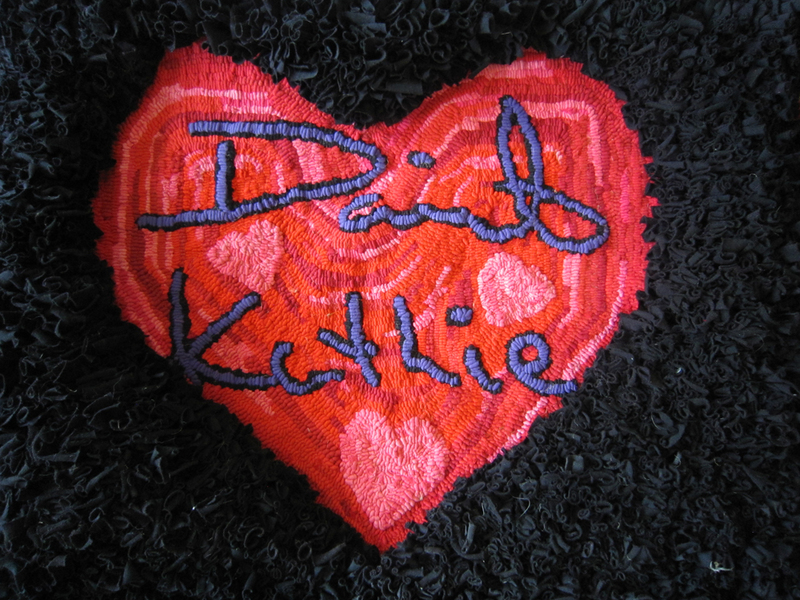 The second heart has a hooked fringe edging, and is decorated with beading. The third heart was inspired by an old WW one book, with imagery of the sky being light by bombs. 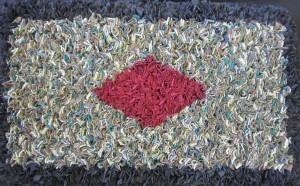 The edge text refers to the Battle of the Somme and the role of the Red Cross. 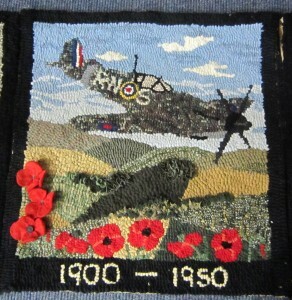 It is lying on its side to remind us of the soldiers who fell. The forth heart cushion is locker hooked on hessian, and is hooked with Denholme velvet,alas the factory is no longer in Denholme. 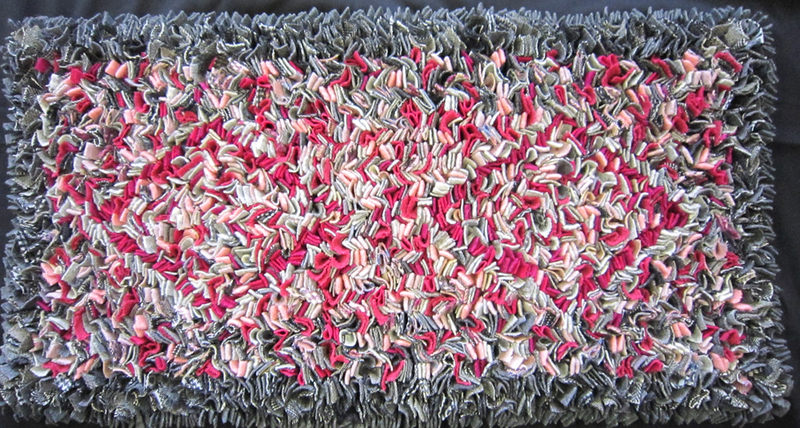 This rug is a lovely wool proddy rug, with almost no hessian showing on the back. 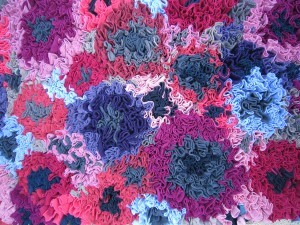 It is in gorgeous colours, which don’t come out as well as I would like on the photo. 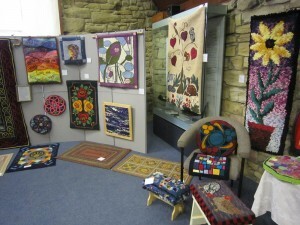 The rug will form part of an exhibition of rugs at the Hawes countryside centre. 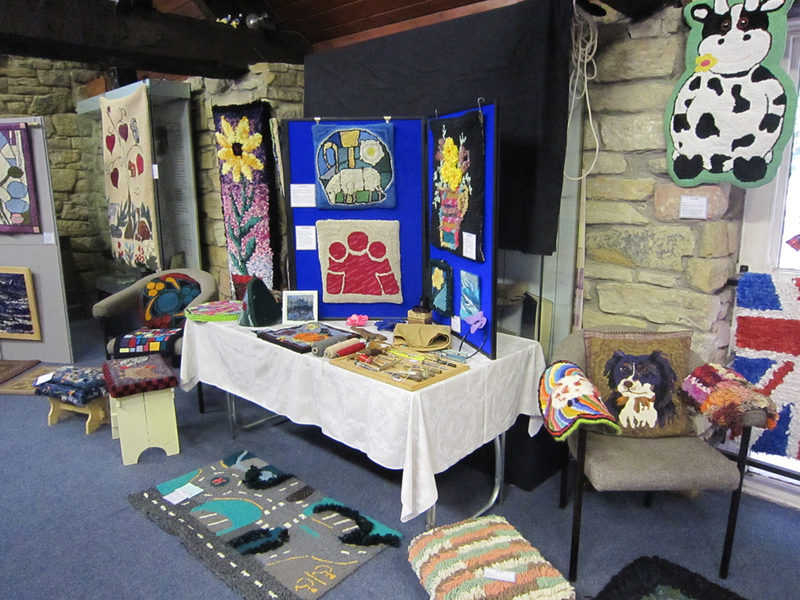 Well done to Jenny and Elaine, for getting to display their rugs in this exhibition. 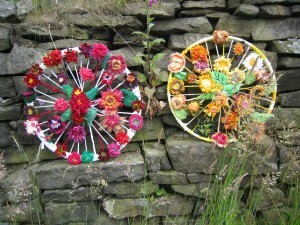 Two friends joined us last year at Cober Hill. Sue started the lurcher rug many years ago, but got a lot of work done on it at Cober Hill, and has just finished it. 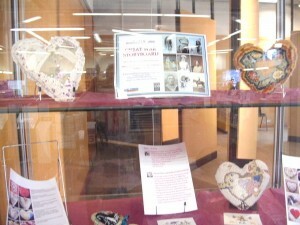 It commemorates Annie, one of their Lurcher dogs. 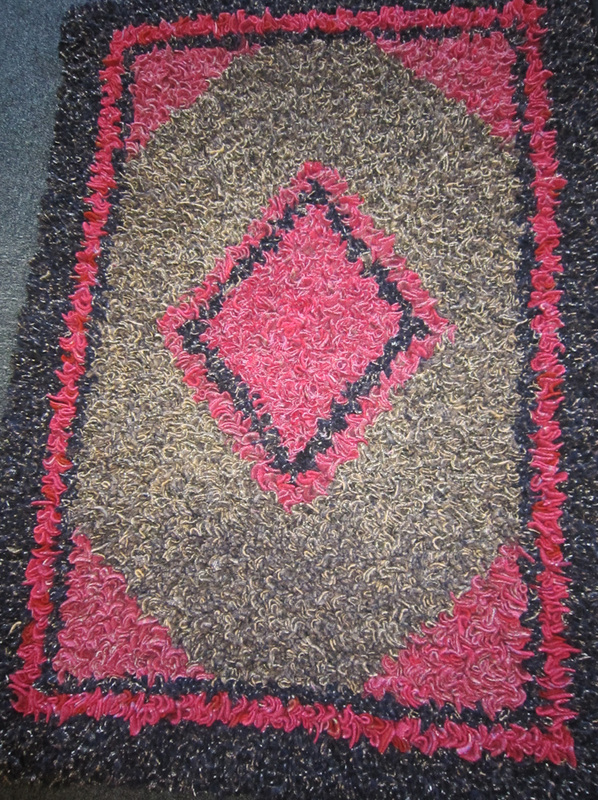 We have very few animal rugs, so this rug was particularly nice to see. 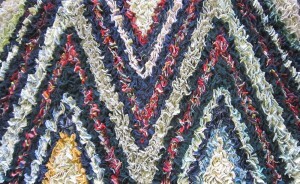 Sue has just finished this two strand braided rug. 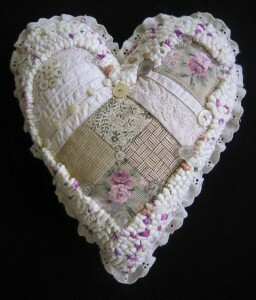 It is made from a duvet set, and is going to be given to a new baby. 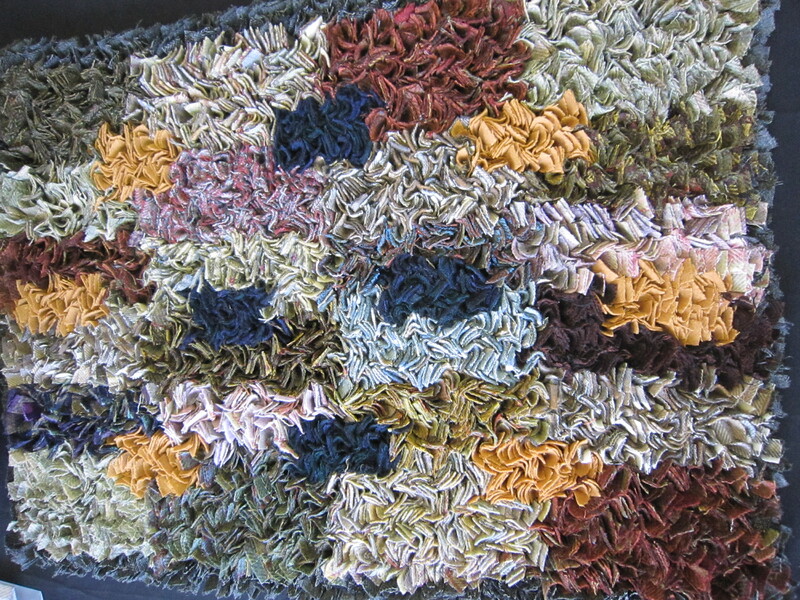 The pattern on the duvet has created a lively rug. 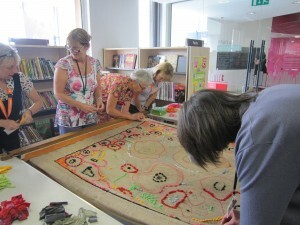 We have been discussing plans to make a reading rug with Bradford library, so not so many finished rugs this time. 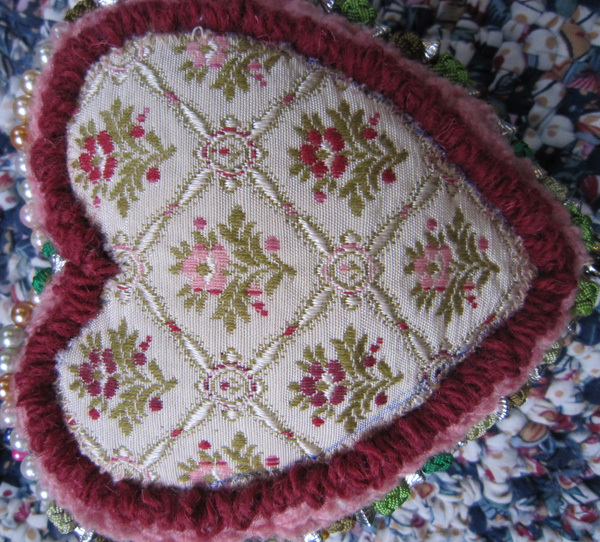 However there are several hearts and bigger rugs nearing completion, so there will be plenty of rugs to see in the next few months..
We welcomed three new members to the group this time, so our numbers are picking up again. The one sweetheart pincushion that is finished is lovely.. think the longer heart shape has worked better than my rather dumpy effort last month. 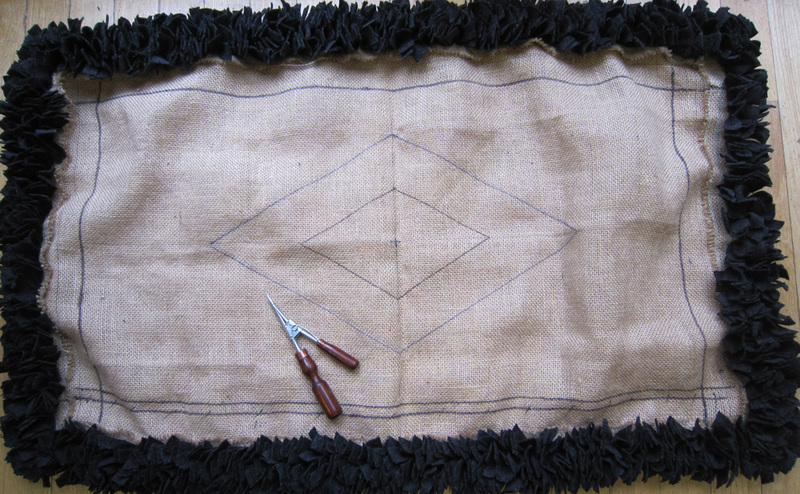 Again there is room to put pins in as well. 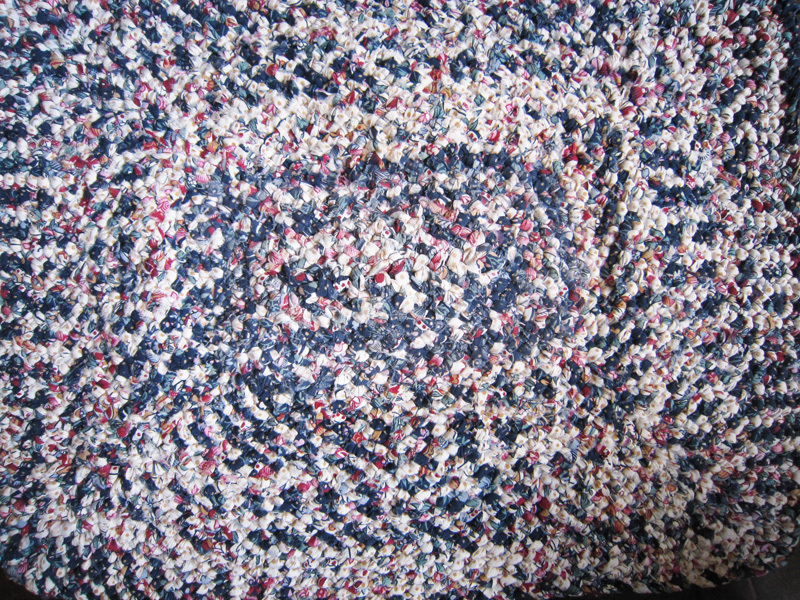 Pictured below is front and back. Kay, who made it also does patchwork and quilting, which explains the immaculate joins… She also tea dyed the fabrics to take away the bright whites, and give a vintage effect. The group had also asked how to insert large beads into hooked pieces, as I had done in the red heart in Januaries meeting pictures. 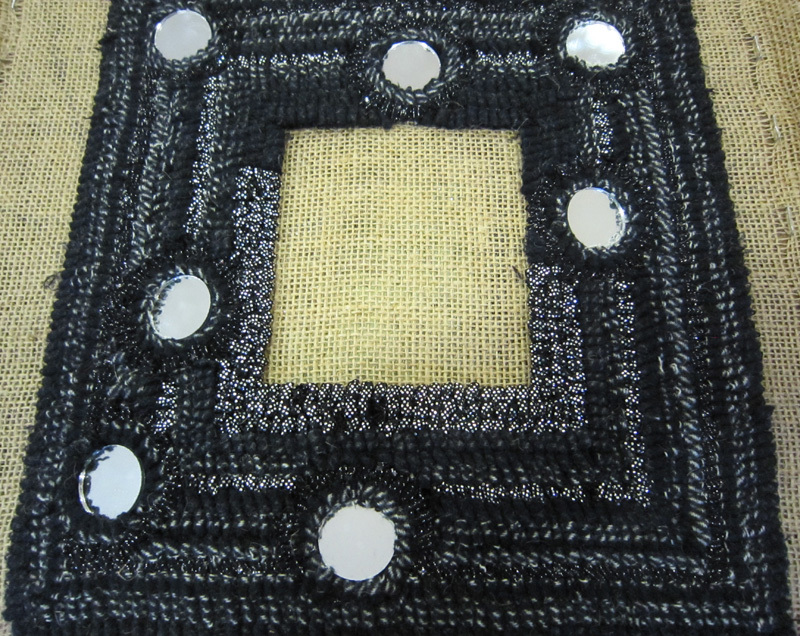 Basically it is a large scale of tambour hooking using a rug hook, sliding a bead into place each time. 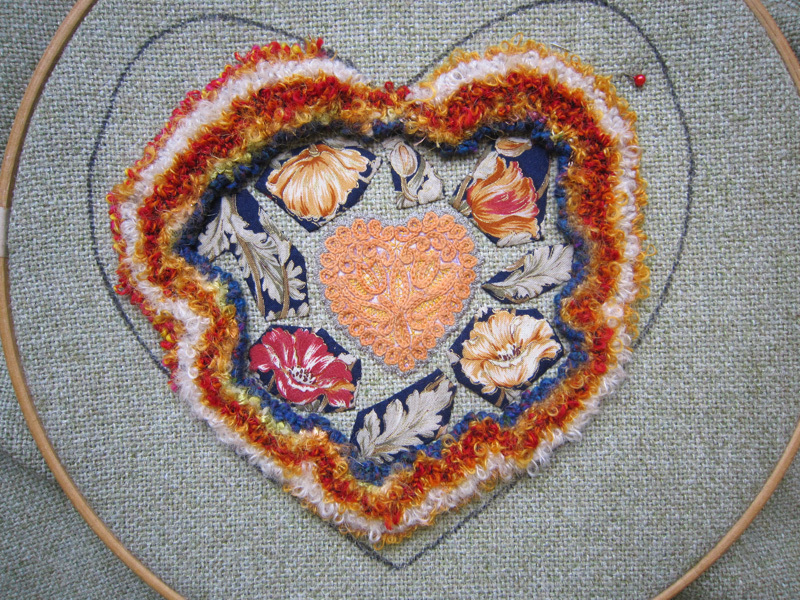 This is a second heart in progress, using the same process. 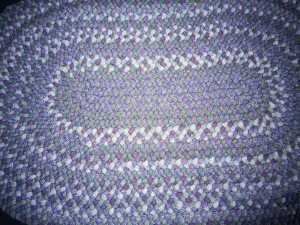 There is one ring of beads around the outside, and a smaller circle of beads in the centre. 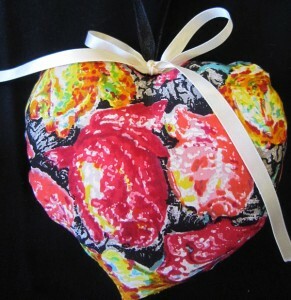 The hooking on both this heart and the one above used tee shirt material with light floral patterns. When the tee shirt is stretched, it leaves bright spots of colour to blend with the overall design. 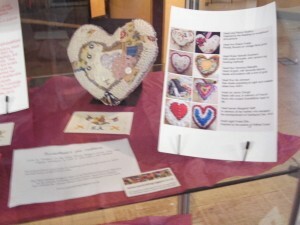 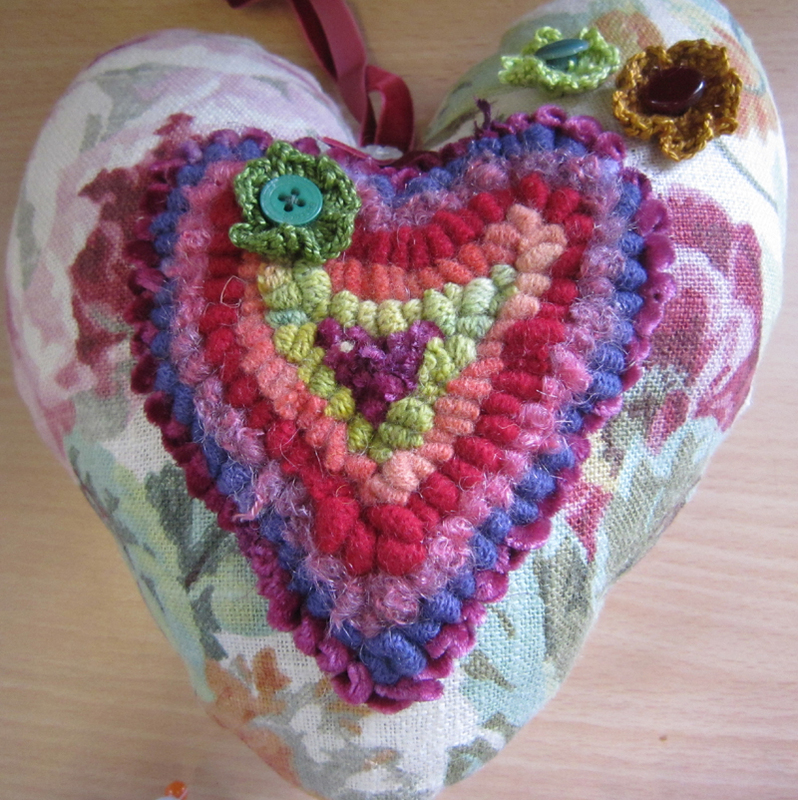 Next month we are hoping to finish the hearts, and also work out how we might celebrate the Yorkshire Tour de France. 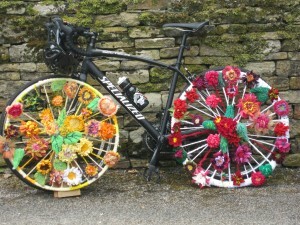 It passes close to our village, and my husband is a keen cyclist, so hopefully we can come up with an inspiring display. 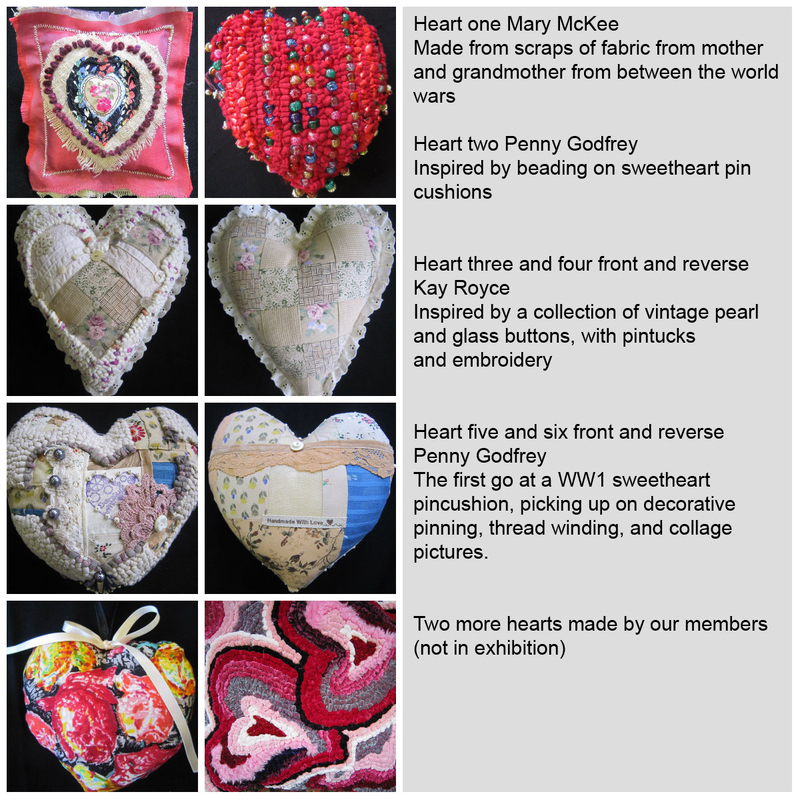 We have started the new year with a new project to explore the WW1 sweetheart pincushions and come up with our own interpretation. 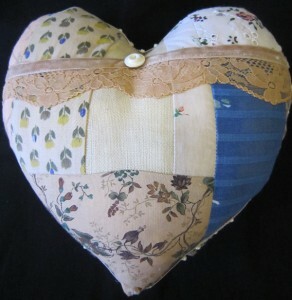 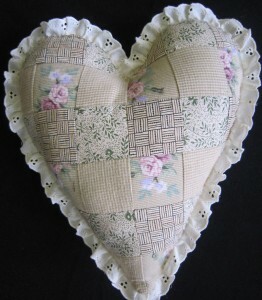 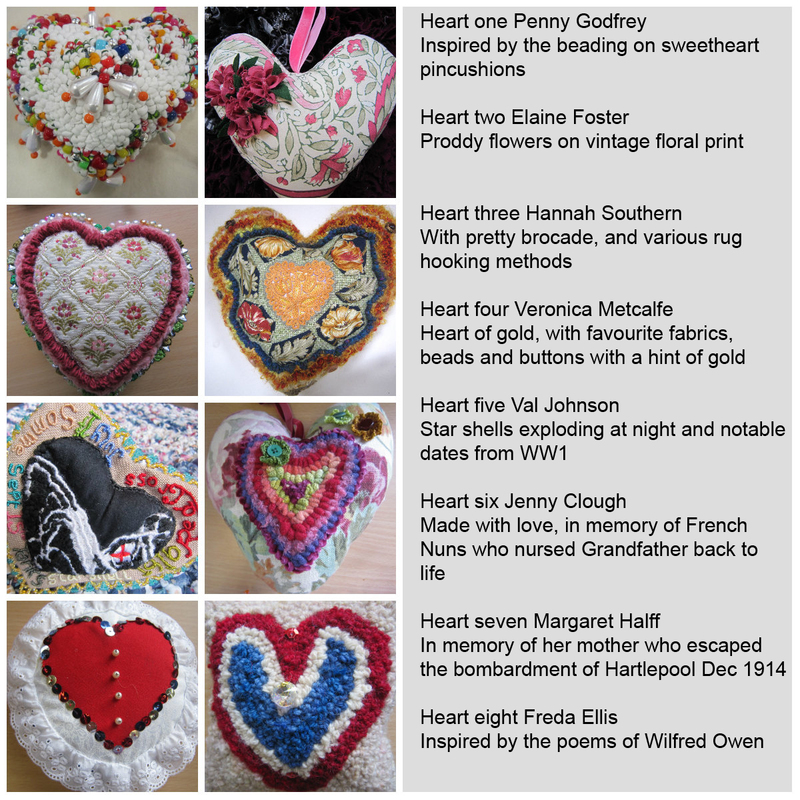 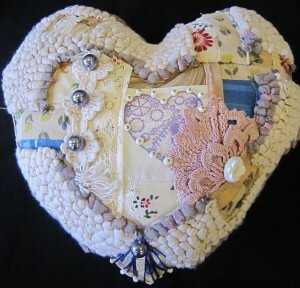 If you search for WW1 sweetheart pincushions on Google, there are lots of pictures to inspire you. I took inspiration from the textile artist Mandy Pattillo, and tea dyed my fabrics to age them. 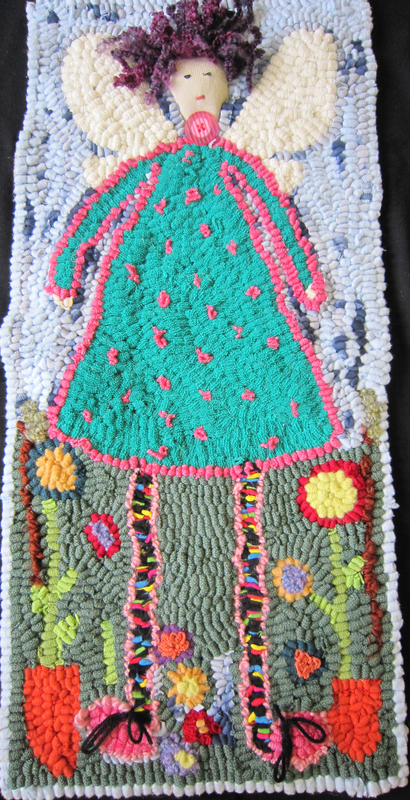 I also took inspiration for the printed area from a workshop incorporating printed elements the group did with Karen Griffiths some years ago.. here is the bag I made. The picture above is the front of my WW1 inspired pincushion. 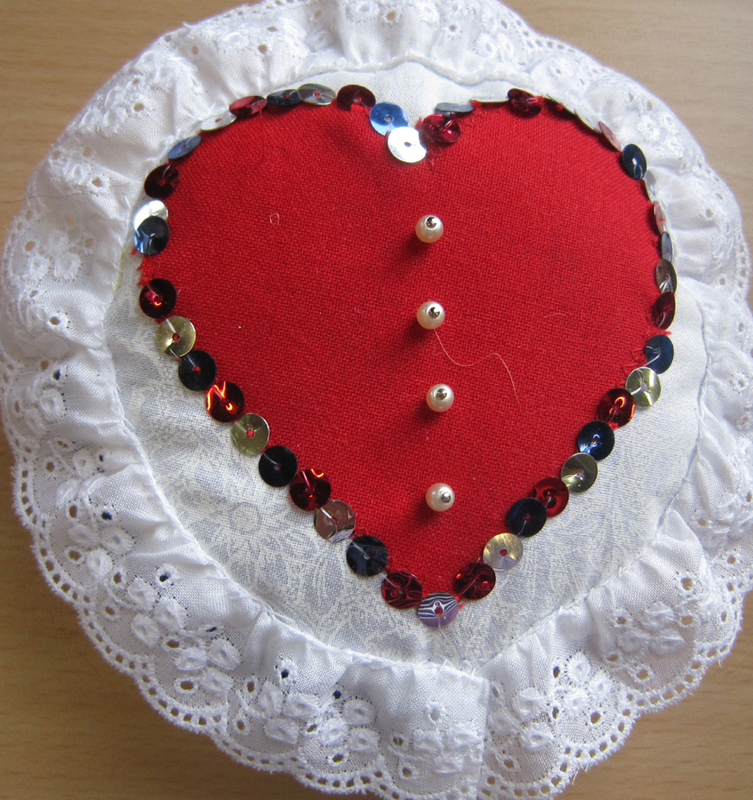 I have incorporating a printed heart, which would be a good place to place pins, as pins cannot be stored in the hooked areas. 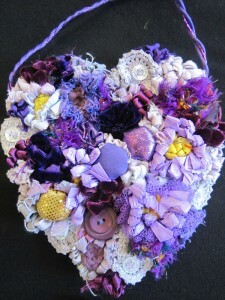 Various hearts and pincushions were also brought along to inspire.. 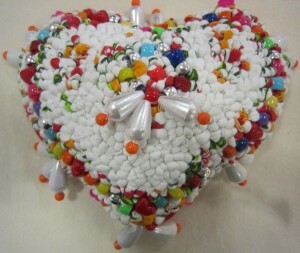 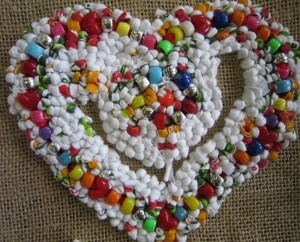 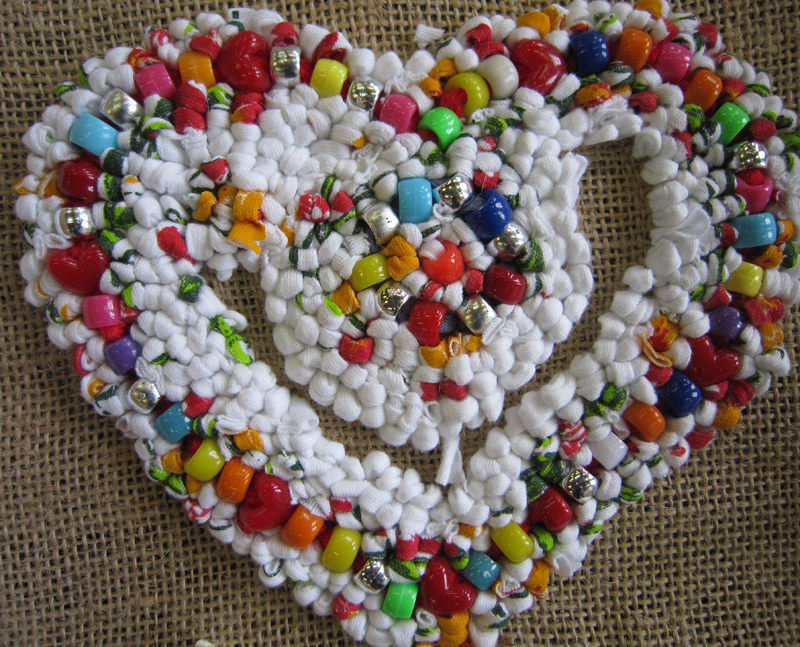 The heart on the left has tamboured pony beads, and we are going to demonstrate how to do this at the February meeting. We also had three new rugs brought to our show and tell. 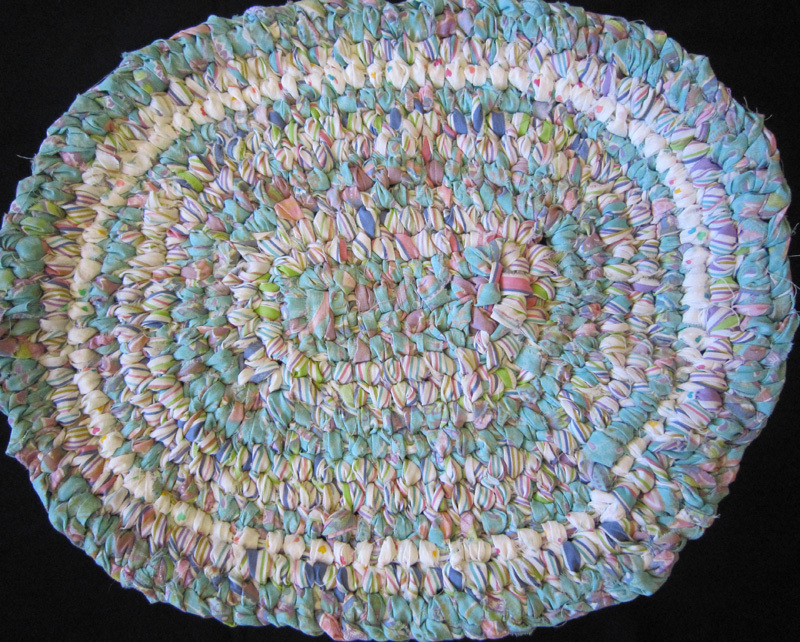 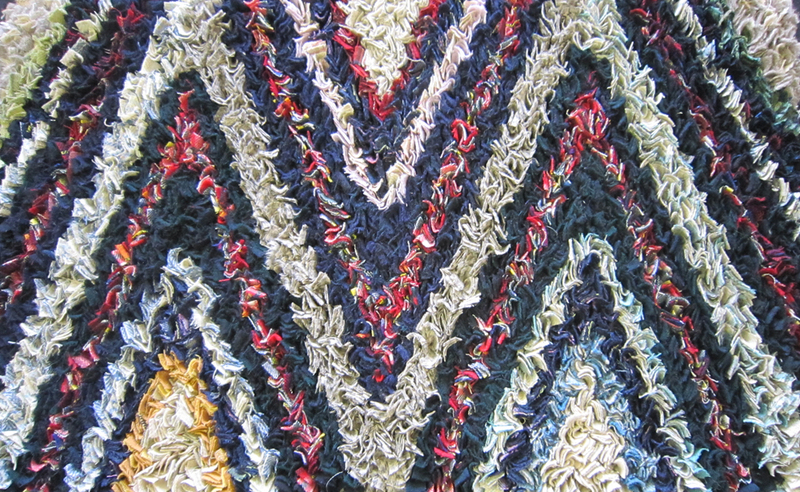 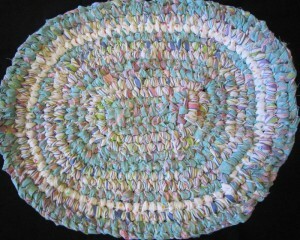 This lovely rug is a two strand braid.. no sewing up at the end… made from cotton sheeting.. and washable. 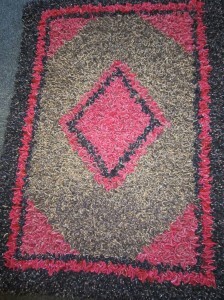 This proddy rug is beautiful.. sorry the photography doesnt do it justice. 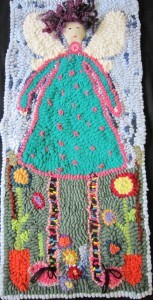 This delightful pictorial rug is a present for a child, who I am sure be delighted. 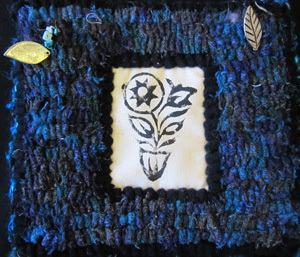 I particularly like the way the tree and flowers inhabit the frame.